No matter what, kids love to play. And if it’s in a historic spot, all the better. But these spaces take a lot of elbow grease and creative fundraising to remain safe and in repair. 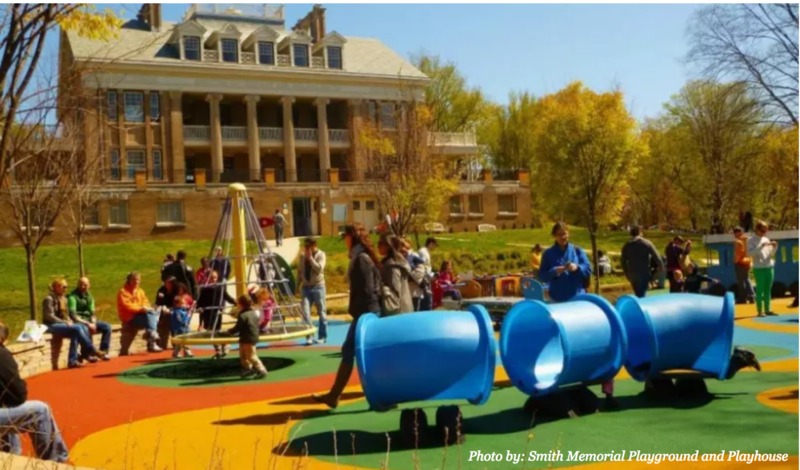 Transformation of an historical building into a child’s fun/learning zone takes even more. Philadelphia’s kid-friendly, history-steeped playgrounds are Franklin Square, a once a neglected magnet for the homeless that boasts a sparkling carousel and a mini-golf homage to the city’s history; Victorian-era Smith Memorial Playground & Playhouse which underwent a multi-stage restoration, including that of a much-loved treasure, the giant slide; and Please Touch Museum, the nation’s first children’s museum in Memorial Hall, originally the Art Pavilion during the 1876 Centennial Exhibition. It may have been one of the three remaining green space squares that founding father William Penn designed for Philadelphia in the 1700s, but that didn’t mean it was always treated like an historic gem. 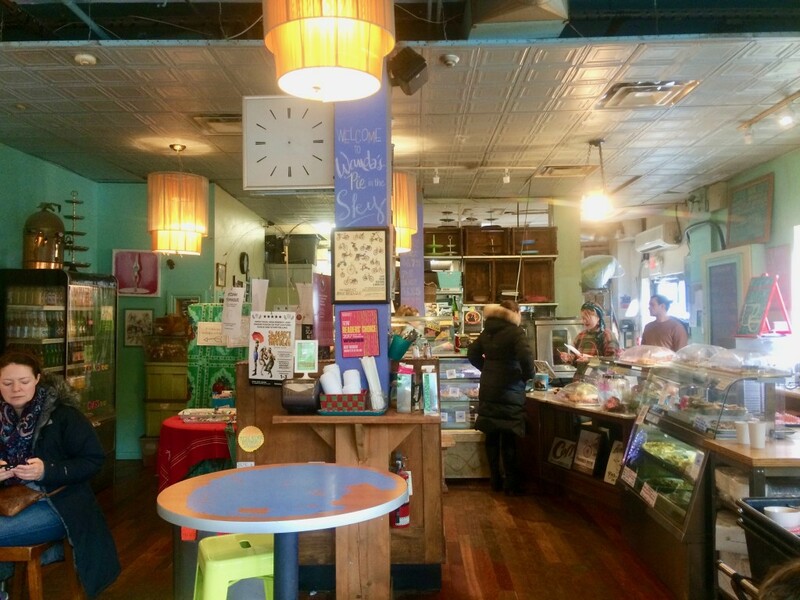 “Daycare workers used to clean away the drug paraphenalia in Franklin Square every morning before letting their charges use the playground,” says Amy Needle, CEO of Historic Philadelphia Inc.,founded in 1994 to promote tourism. Needle’s group, along with Fairmount Parks, is responsible for the 7.5-acre square’s rebirth. Reopened in 2006, the square, which is a few blocks from Independence Mall at 6th and Race Streets, cost $6.5 million to renovate. 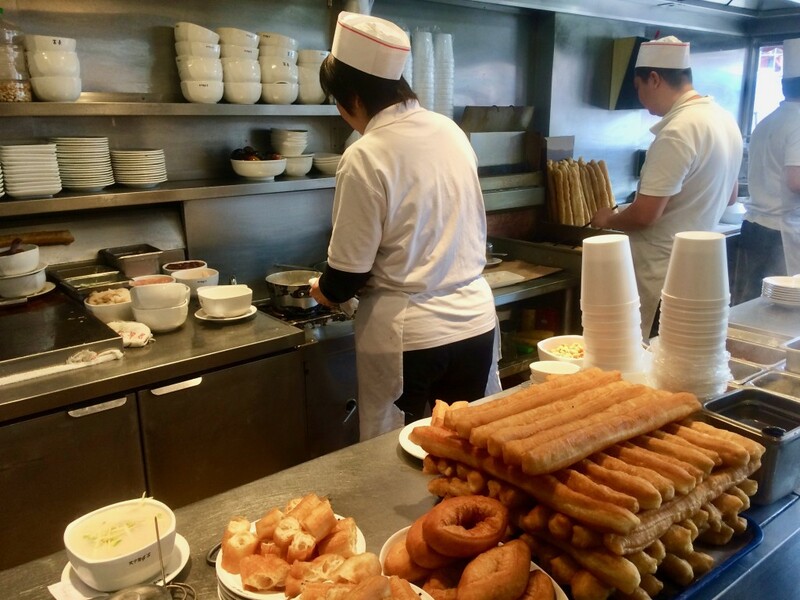 It’s star attractions are a carousel painted with Philly scenes including boathouse row, a mini-golf game that features music by homegrown stars such as Patti Labelle, and food vendors with brotherly love staples such as soft pretzels. 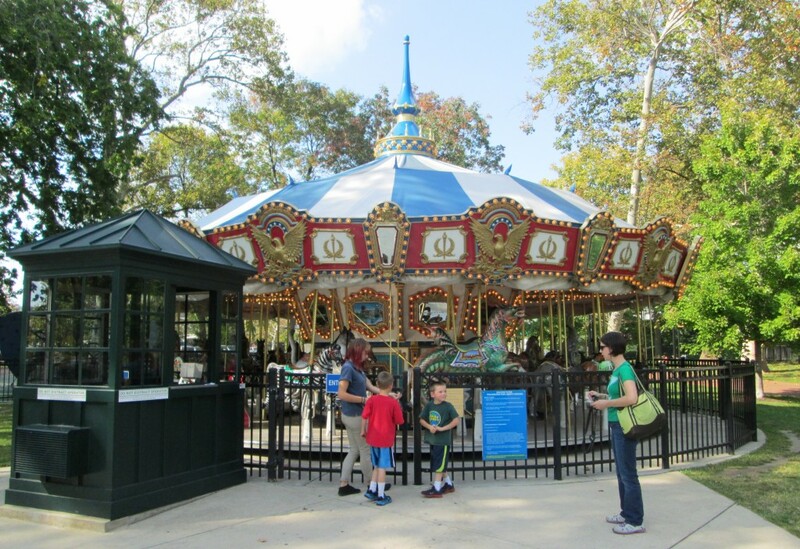 The inclusion of Philadelphia Park Liberty Carousel, 36 feet in diameter and outfitted with 30 carved figures (including a sea dragon and eagle), is fitting since Philadelphia was once the carousel-making capital of the world. In the mid-19th century it was home to three manufacturers, Philadelphia Toboggan Company, Dentzel Carousel Company of Philadelphia and D.C. Mueller & Bro. The carousel in the square today was made by Chance Morgan Co. in Wichita, Ka., using original moulds from the Dentzel Carousel Company and Philadelphia Toboggan Company. 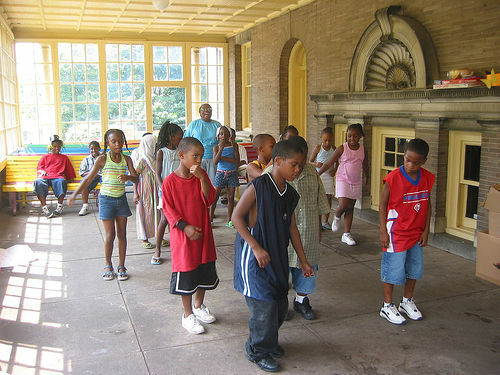 Deep in East Fairmount Park is an imposing three-story Beaux-Arts mansion, built just for kids. Designed by architect James H. Windrim at the height of the late nineteenth century Play Movement, the 24,000-square-foot Playhouse opened in 1899 and has remained open ever since. Outside on the Playground’s six-and-a-half acres, is the Giant Wooden Slide —a 40-foot-long, 12-foot-wide, 10-foot-high covered maple slide that was installed in 1905 and fits up to twelve children abreast. “The slide is one of the most unique sights I’ve ever known. There has been an enormous affection for it for generations,” notes Hope Zoss, the site’s executive director. In 2003, the Playground closed due to the equipment not being up to safety standards. With the help of a donation of $325,000 from a 92-year-old donor who had fond memories of the slide as a child, upgrades were made and it reopened in 2005, bearing her daughter’s name, the Ann Newman Giant Wooden Slide.The second phase of improvement took place the following year with the installation of 18 swings. The Playhouse, which is aimed primarily at the under-five set, offers indoor activities such as riding tricycles through a child-sized “town,” and a puppet show theatre. 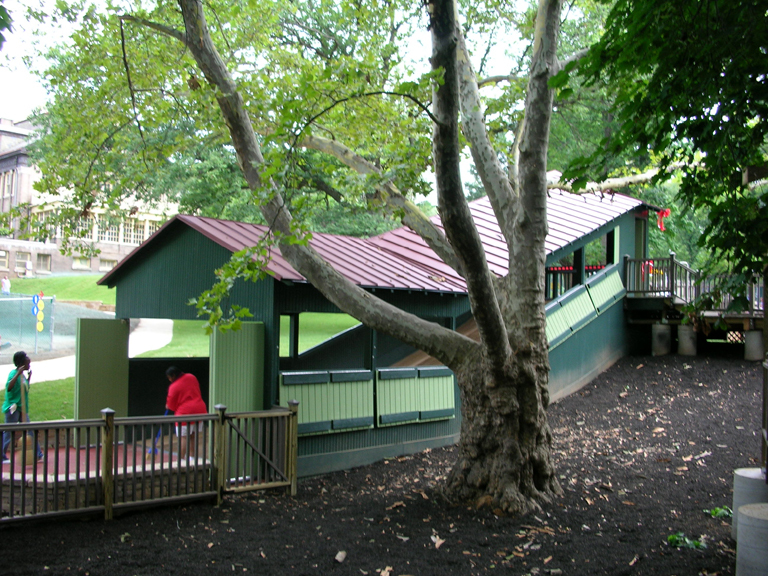 Richard and Sarah Smith (he was a wealthy Philadelphian who made his money in typesetting) built the site as a memorial to their son and as a country play haven for inner-city children. Since opening, it has drawn up to 1,000 visitors a day, from every income level. In 1977 it was listed on the City Historic Register. Memorial Hall, built for the 1876 Centennial Exhibition in West Fairmount Park after its inception as an Art Pavilion, served a few purposes, including headquarters for the Fairmount Park Commission. Its new role as the Please Touch Museum is far more playful. The Beaux-arts building reopened in 2008 with 135,000 square feet of exhibits including a 40-foot high replica of the Statue of Liberty arm and torch created by artist Leo Sewell out of toys (the statue’s original arm and torch graced the 1876 exhibit), and a 1924 Dentzel Carousel Company of Philadelphia carousel, on loan from the Pennsylvania Historical and Museum Commission. Originally, the carousel operated at Woodside Park, less than 10 blocks away. Additional exhibits include a flight fantasy area with propeller bike and flying machine and Alice’s Adventures in Wonderland with rabbit hole slide. Plus, there are other hands-on displays of inventions unveiled at the 1876 fair such as the typewriter and root beer. Memorial Hall, a National Historic Landmark, was renovated according to standards set by the Secretary of the U.S. Department of the Interior. Of the museum’s $88 million budget (raised through government, individuals and corporations), $40 million went into building upgrades such as new windows. Much of the renovation involved removal of 1950s intrusions such as dropped ceilings. “It was in good shape structurally when we got it. The soaring atrium is 150 feet tall and was concealed by walls that had been put in,” explains Willard Whitson, the museum’s vice president, exhibits and education. The decorative filigree and statuary uncovered around the atrium dome are in “wonderful condition,” says Whitson. It’s a happy fact that history, when preserved and sprinkled with imagination, can deliver a whole lot of fun and learning for kids and adults alike. Technology might be making advances at the speed of sound, but Philly’s historic play havens prove that old fashion fun still has power for today’s kids. 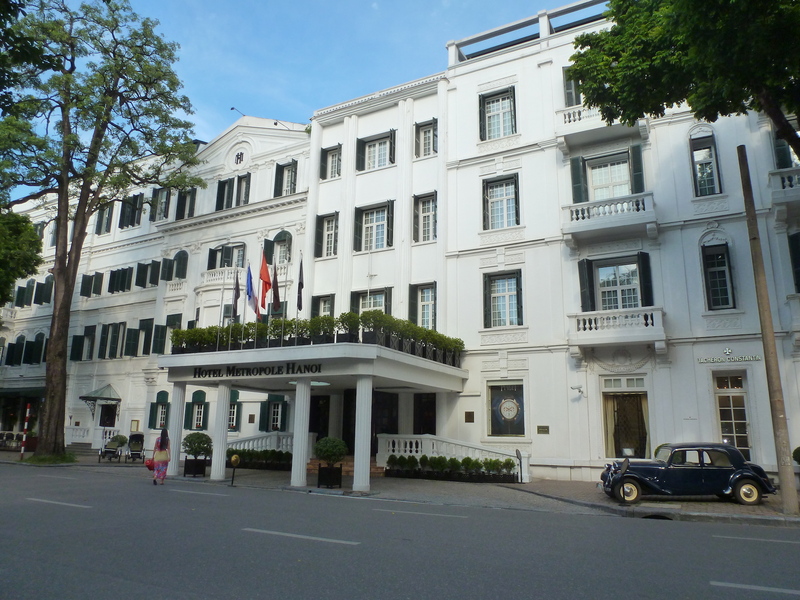 The plush Sofitel Legend Metropole Hanoi is a standout of French colonial architecture and was a favourite place of mine to have an afternoon coffee, evening cocktail by the pool or special birthday dinner. Why? It boasts a rich history and many cultural icons have stayed and created literary works here over the years. Designed by architects André Ducamp and Gustave-Émile Dumoutier, the hotel’s doors opened in 1901. After a secret marriage in Shanghai in 1936, Charlie Chaplin spent his honeymoon here with one of Hollywood’s famous female stars, Paulette Goddard. The hotel even named a suite in Chaplin’s honour. 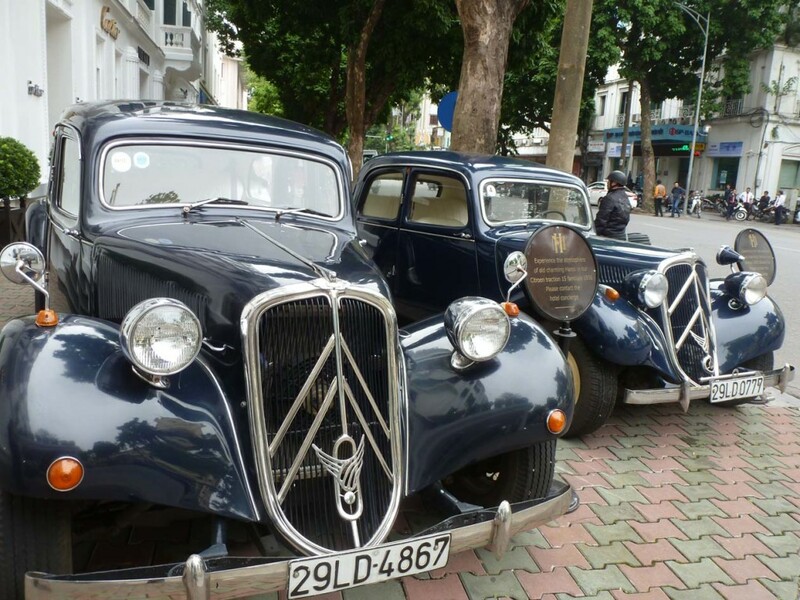 Vintage Citroens that are available to guests for city jaunts. Celebrated British authur Somerset Maugham wrote The Gentleman in the Parlour about his observations in Indochine and Graham Greene wrote The Quiet American. Greene stayed at the hotel in 1951 as a war correspondent and his experiences discovering “the third force” (covert support of the CIA) inspired him to write a novel that illuminated Vietnam’s independence struggles and the United States’ interference. A very insightful read about how the seeds of the Vietnam War were sown. Both Maugham and Greene also have hotel suites named after them, as well. In the 1960s, a bomb shelter was built in the basement and in 1972, during the Vietnam war, actress and anti-war activist Jane Fonda stayed here, as did singer/songwriter Joan Baez. On her return from Vietnam in 1973, Baez released the album, Where Are You Now, My Son? that includes the air-raid sirens and dropping bombs she heard outside. 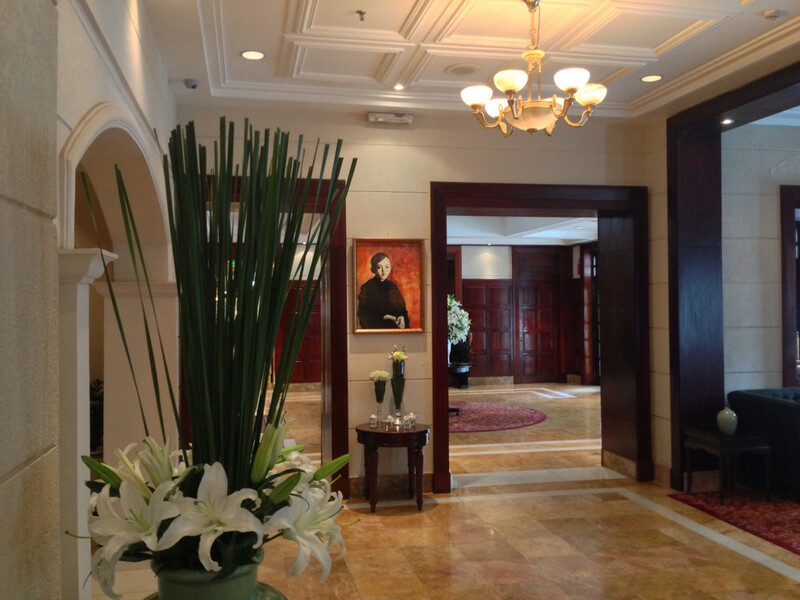 Baez has give up singing for painting and on a trip to Hanoi in 2013 she stayed at the hotel and painted a portrait of a young Vietnamese boy which is now hanging in the lobby. 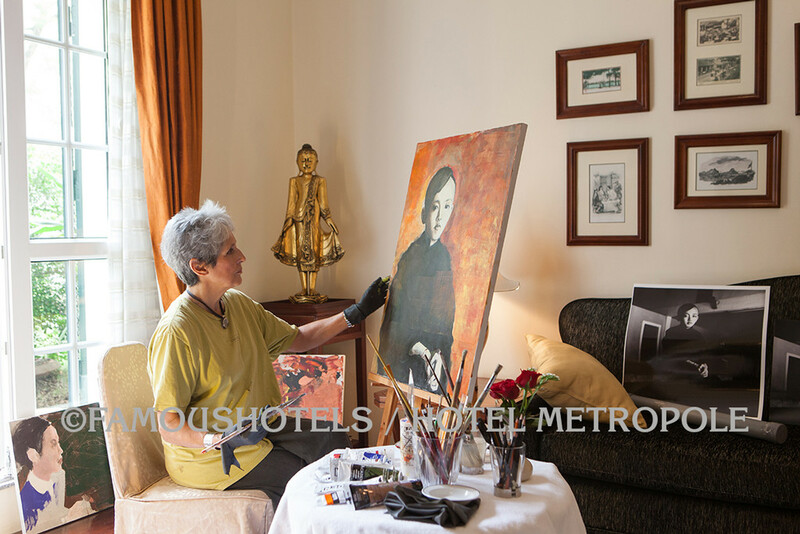 Here’s a shot I took from the Metropole website of Baez completing the painting. More recently, in 2009, the hotel named its new restaurant Angelina after actress and guest Angelina Jolie whose son Pax was adopted from an orphanage in Vietnam. Other movers and shakers who have stayed here include Mark Zuckerberg, Vladimir Putin and Angela Merkel. And me? Well, I like to eat, drink and get inspired here, especially on the gorgeous terrace. 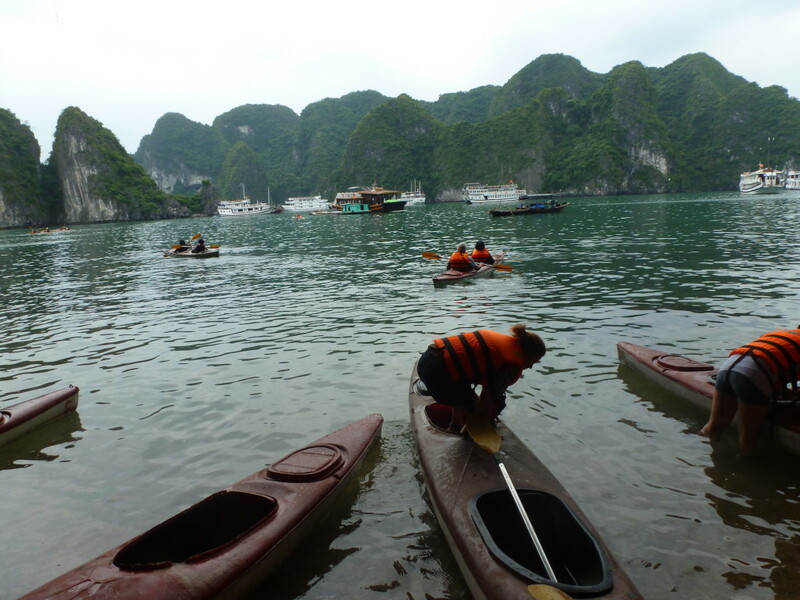 Halong Bay is around a three-hour drive northeast of Hanoi and well worth the trip. The UNESCO World Heritage Site’s name translates to “descending dragon” and the bay features thousands of limestone karsts and isles in various shapes and sizes. 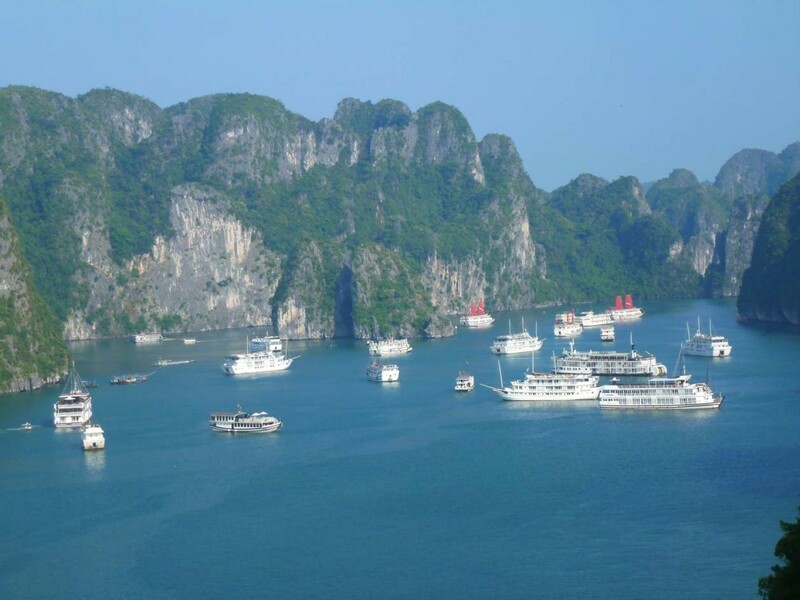 Halong Bay is a center of a larger zone which includes Bai Tu Long Bay to the northeast, and Cat Ba Island to the southwest. These larger zones share a similar geological, geographical, geomorphological, climate, and cultural characters. 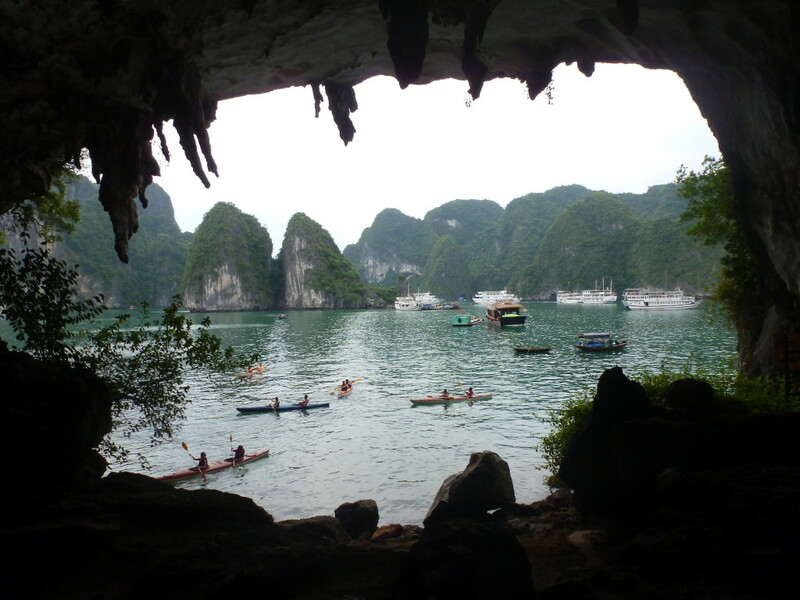 The area has amazing kayaking and there are many caves to explore. My husband and I took an overnight junk boat trip and were able to spend an afternoon paddling past the towering stone formations. 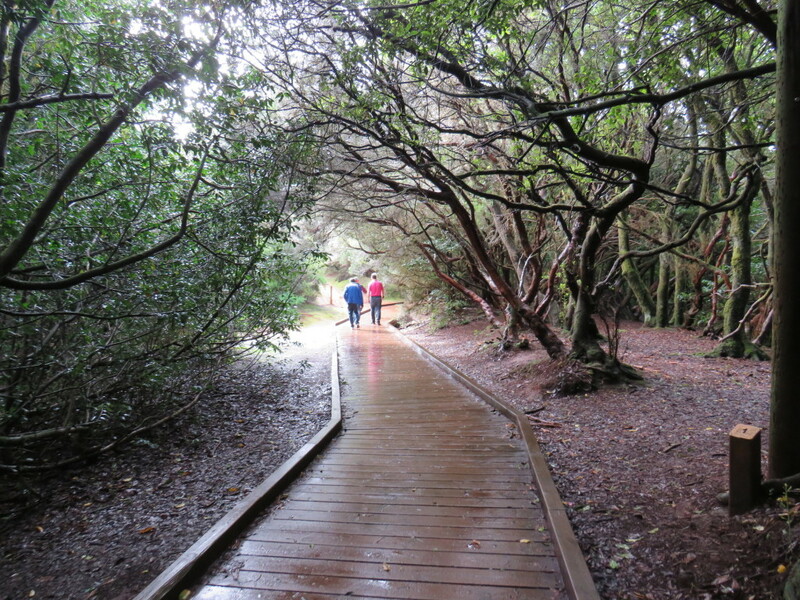 The caves were also a delight to walk through, having paths and colourful lighting. 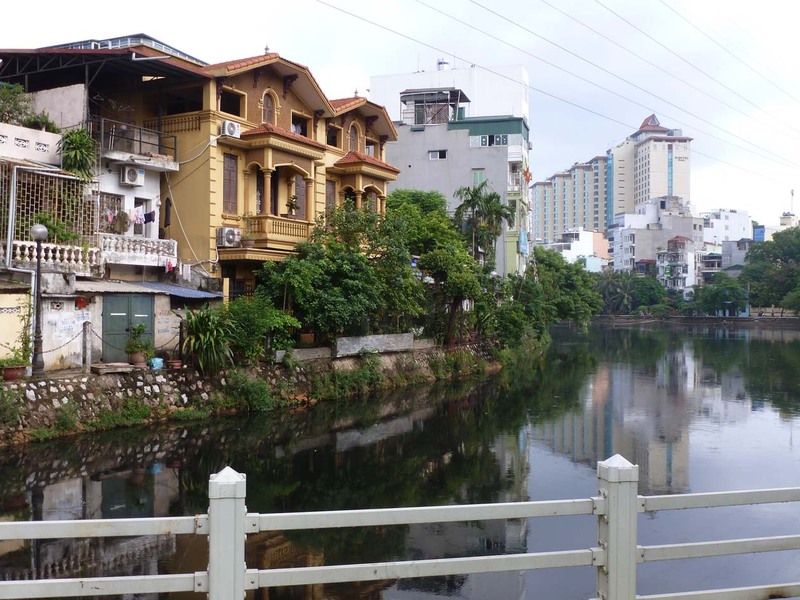 When I lived in Hanoi, I had an apartment in the quiet enclave of Truc Bach. It is on tiny Truc Bach Lake, a diked off portion of Tay Ho Lake. I was a little shocked to learn this is where the late Senator John McCain landed when he was shot down during the Vietnam War (known here as the American War), in 1967. Searching the internet I learned that US Navy aviator John McCain was shot down by anti-aircraft missile on a mission against a Hanoi powerplant and parachuted wounded into Truc Bach Lake, nearly drowning. He was dragged out of the water and beaten by city residents who were angry at having seen the area razed by previous U.S. attacks. He was later taken away as a prisoner of war. 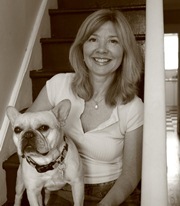 Photo courtesy Wikimedia Commons. I came upon a monument marking his downing called Tchen Sney Ma Can on the western shore of the lake. Beside the depiction of a downed airman, there’s an inscrption in Vietnamese saying, “On Oct 26, 1967, at Truc Bach Lake, the military and people of Hanoi arrested Major John Sidney McCain, a pilot of the American Navy’s air force.” This shot (courtesy the U.S. Defense website) is of Defense Secretary Ash’s visit to Hanoi in 2015. 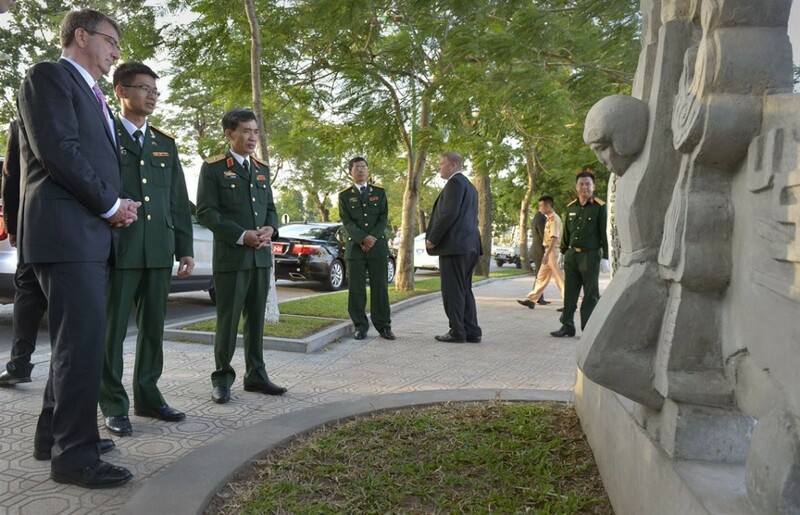 Apprently, when McCain made a trip to Vietnam in 1985, he returned to this spot. A lot has changed since his horrible experience. Most people in Vietnam are under the age of 30 and don’t even know who he was. 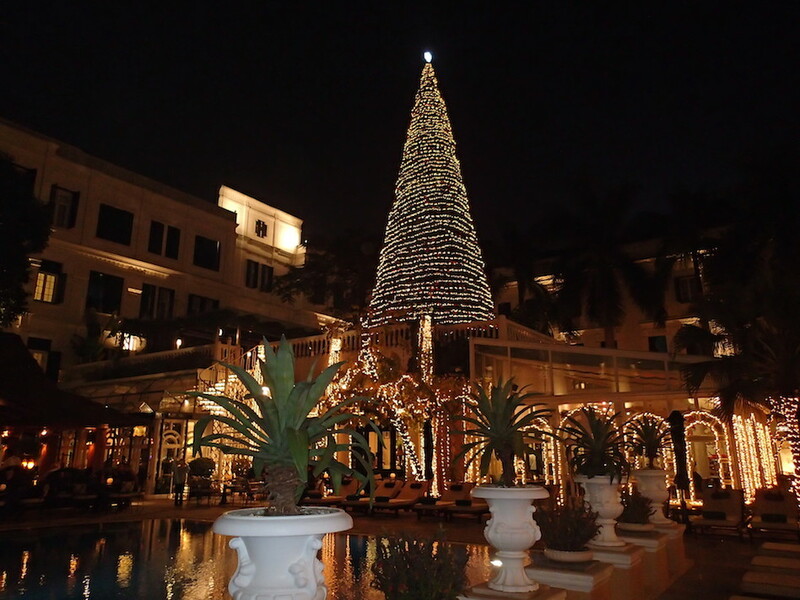 Plus, the Truc Bach and Tay Ho area is now filled will posh hotels including the Sofitel, the Hanoi Club and the Sheraton. It’s a very desirable neighbourhood. 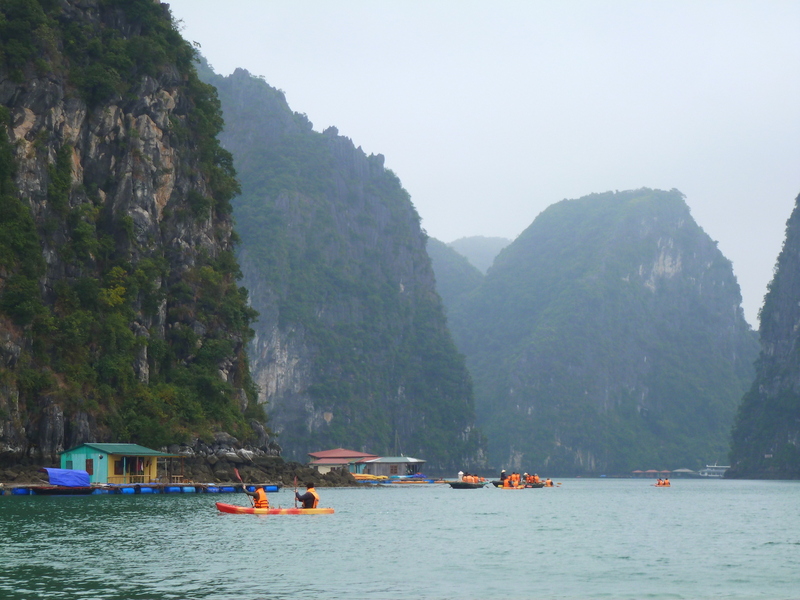 1)	Truc Bach was separtated from Tay Ho by the construction of a dike in the 17th century, allowing inhabitants to fish. Today, it is extremely polluted although there are still lots of fishermen and nets to be seen. 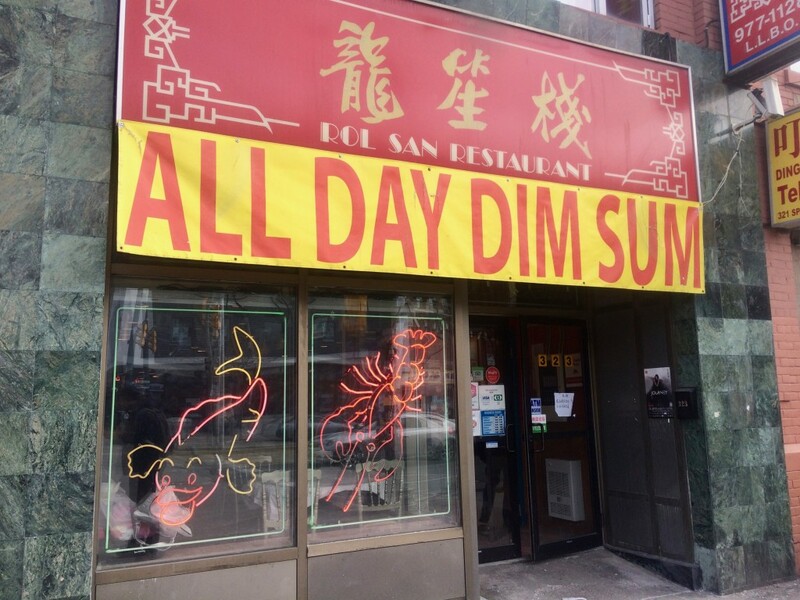 I would advise against eating anything caught here. 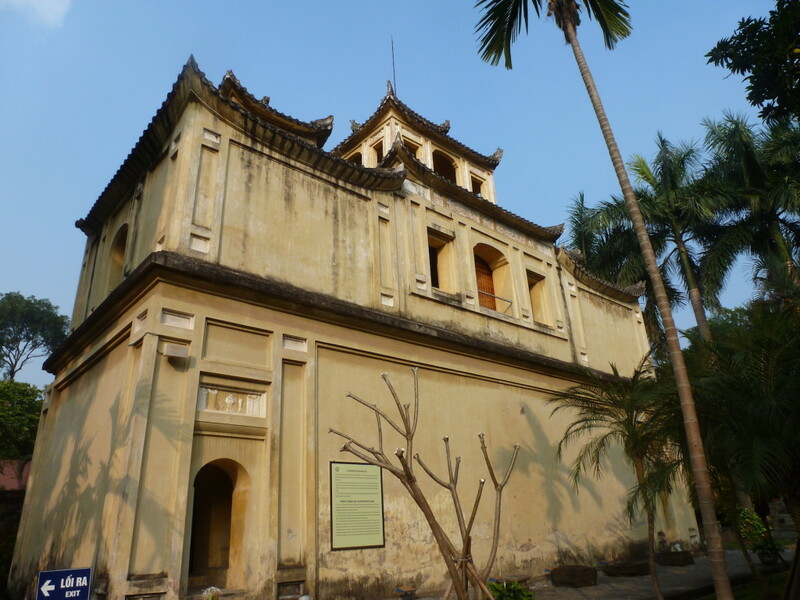 2)	In the 1700s, Truc Lam Palace was constructed on the lake shore. It first served as a pleasure palace housing concubines, but was later converted in to a prison for royal concubines found guilty of crime. The silk they produced became known as ‘Bamboo Village’ Silk and was famous for its beauty. At the time, the area was known also for its crafters of bamboo blinds. 3)	According to history, during the Le Dynasty (1428 – 1527), people of the 5 villages Dong Mai, Chau My, Long Thuong, Dien Tien and Dao Vien (from Hung Yen and Bac Ninh provinces), who were skillful at bronze casting, migrated to the capital to establish a casting workshop for business. They settled in the Truc Bach area and set up a new village called Ngu Xa to remember their five original villages. Afterwards they reorganized into a separate professional guild called Ngu Xa bronze-casting guild. 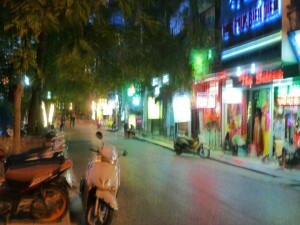 Nowadays Ngu Xa Street is still there to the east of the Truc Bach Lake, in Ba Dinh District. There’s a really interesting article that gives more detail on the bronze casters there who are still practicing their craft by Vu Thu Ha in the Viet Nam News. 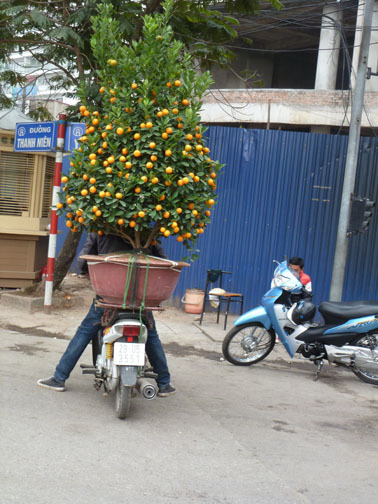 In Hanoi, the biggest holiday of the year is Tet, celebrating the Lunar New Year. 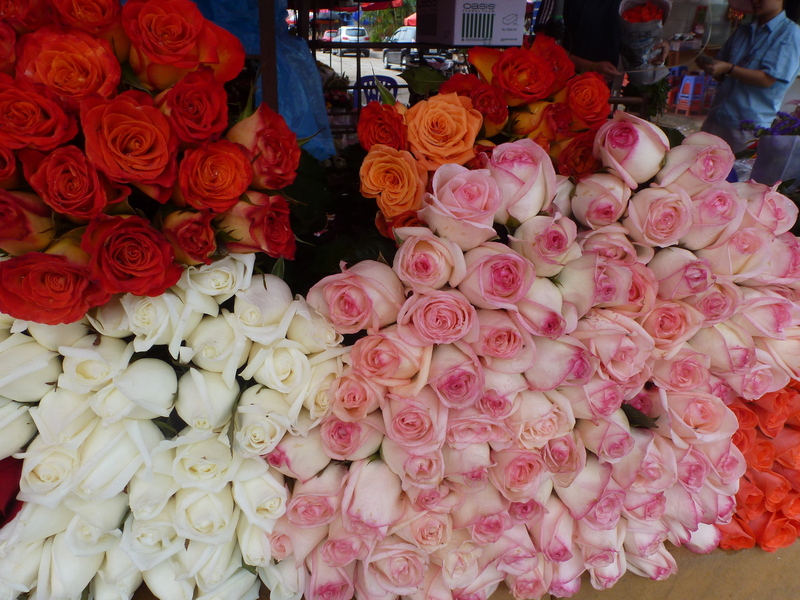 Tet usually falls around late January/early February and has to be the biggest season for flower sellers, especially at Quang Ba Flower Market, in Tay Ho, near where I lived. 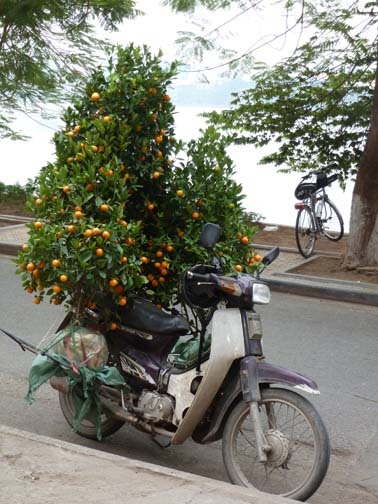 I noticed marumi kumquat plants were in as high demand as evergreen trees at Christmas in the West. 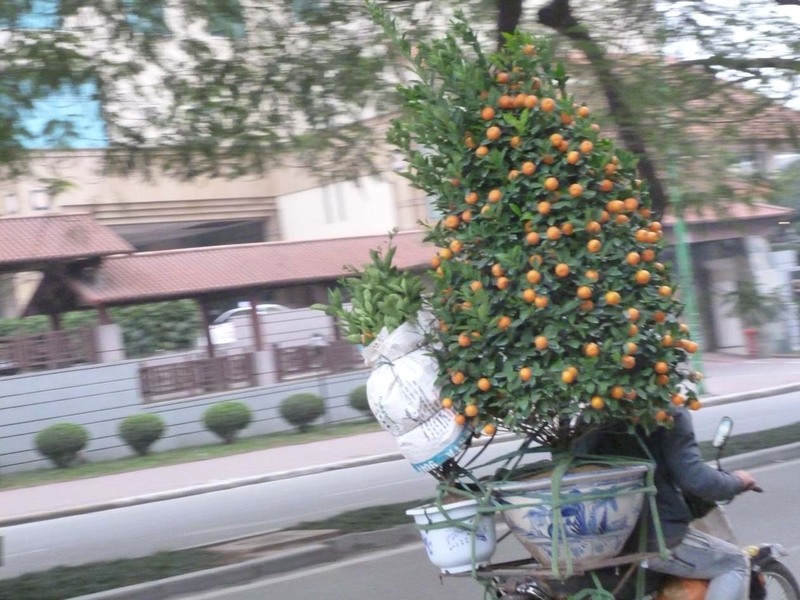 A couple of weeks before Tet, the streets are crowded with motor scooters burdened with bushy green pyramids covered in with small orange fruit. Although the fruit looks like a mandarin orange, it is sour (the peel is the sweetest part) and few people eat them. The kumquat tree symbolizes gold, wealth, unity and perfection. So the selection on each tree purchased is not taken lightly. The marumi kumquat is a tree with five characteristics that must be considered when buying – fruit, flowers, leaves, branches and roots. 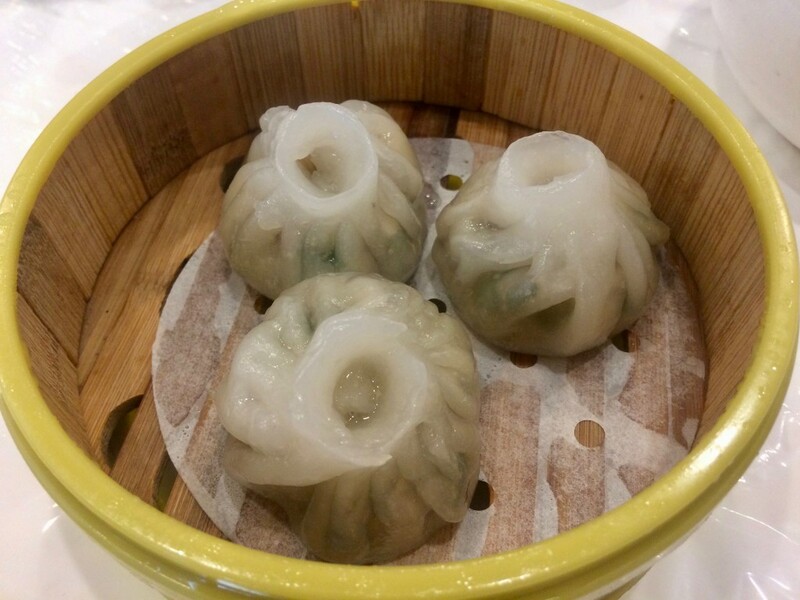 Combined, they symbolize wealth and happiness for the new year. Tips for choosing a good plant? 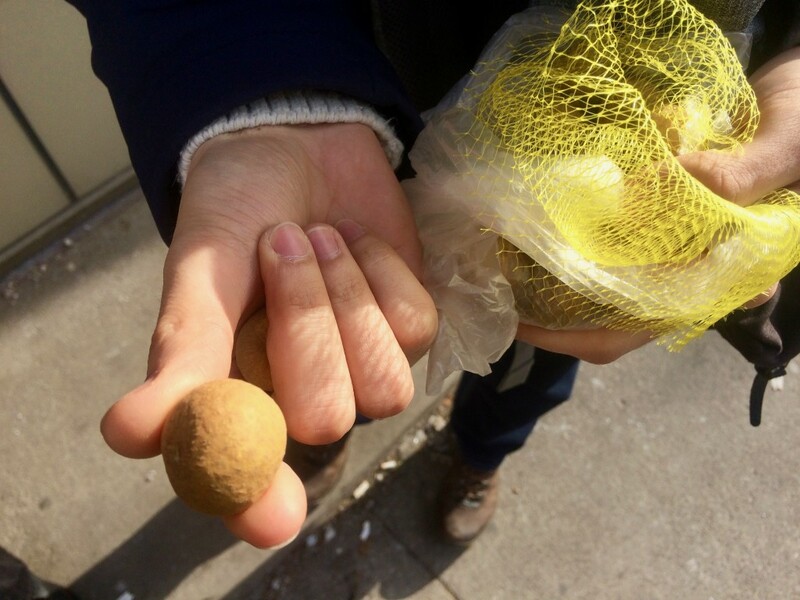 The tree must have both ripe and green fruit, mature leaves and new buds. If it has all these, the family will enjoy wealth and luck in the new year. Another popular item at the nursery is peach trees since its flowers blossom in spring – sometimes even during Tet holidays, but it was too cold for this during my time there. 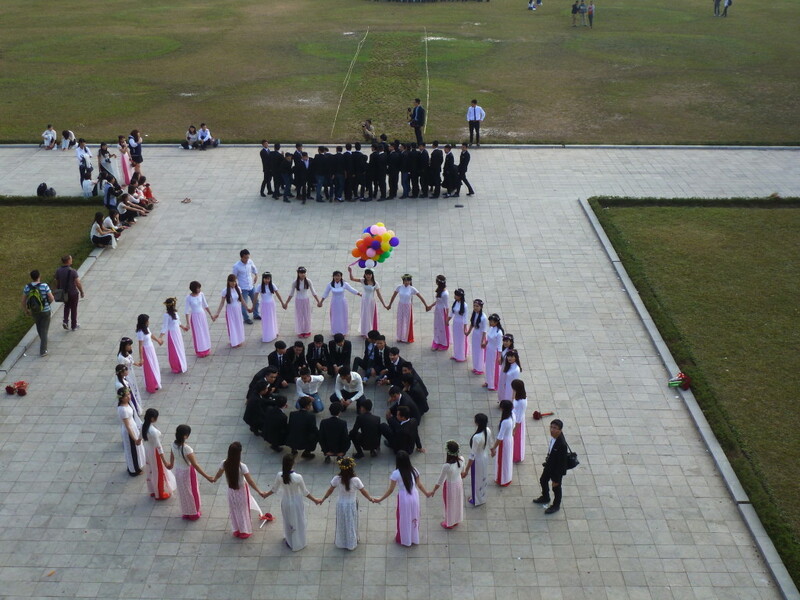 Vietnamese believe this symbolizes a strong vitality and brave heart. The colour of the flowers is important, too. 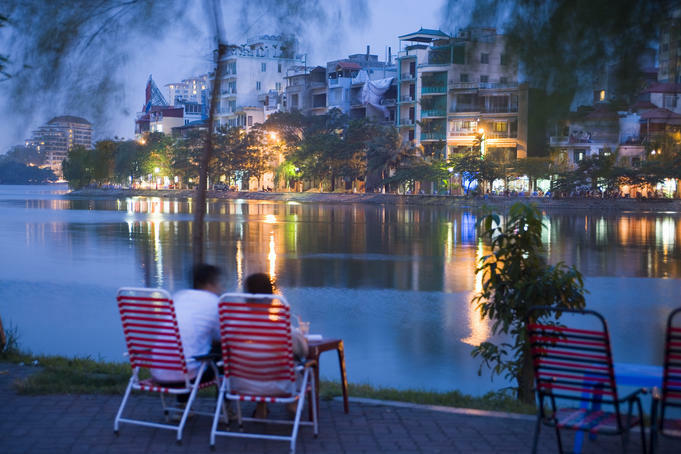 In Hanoi, the dark pink blossom is favoured, showing the love and joy spread among people in this unique time of the year. 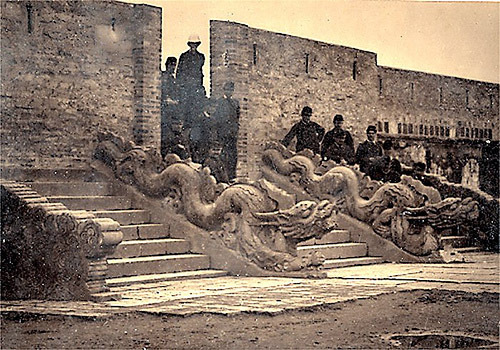 The royal palaces and most of the structures in Thăng Long were in varying states of disrepair by the late 19th century with the upheaval of the French conquest of Hanoi. By the 20th century many of the remaining structures were torn down. Excavations began in the 21st century and in 2004 the site was opened to the public. 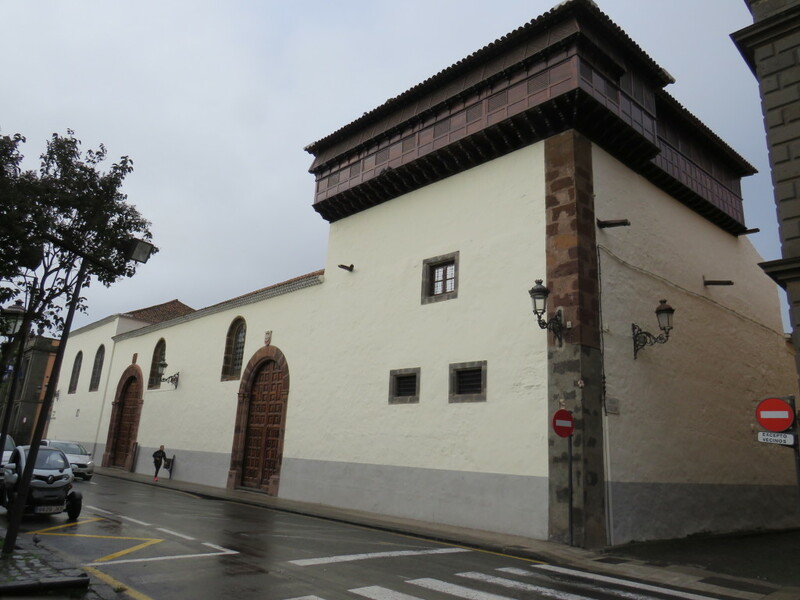 The central sector of the imperial citadel was listed in UNESCO’s World Heritage Site on July 31, 2010. 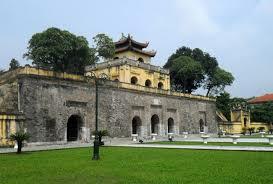 The few remaining structures within the royal compound are the Doan Mon gate, marking the southern entrance to the royal palace, the Flag Tower, the steps of Kinh Thiên Palace and the Hậu Lâu (Princess’ Palace). 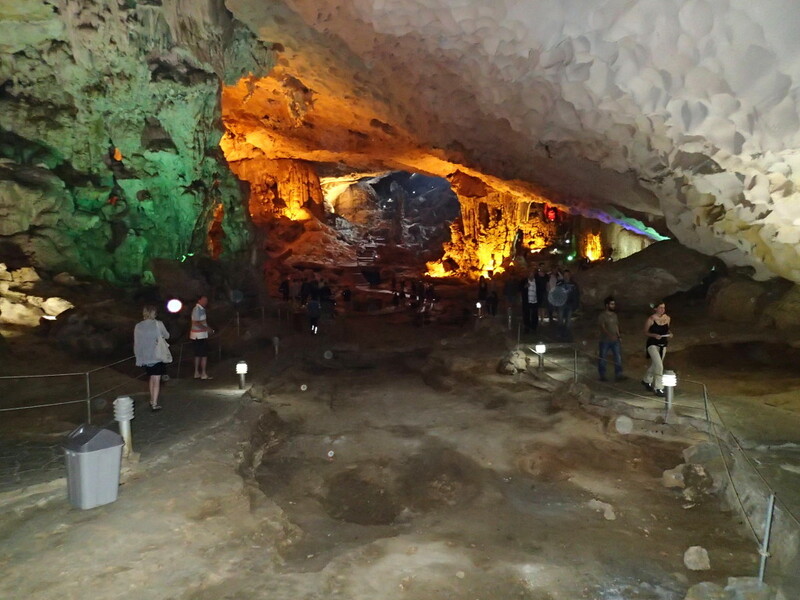 Thus far only a small fraction of Thăng Long has been excavated. Perhaps the most iconic of the remaining structures is the Flag Tower. Rising to a height of 33.4 m (41 m with the flag), it is frequently used as a symbol of the city. 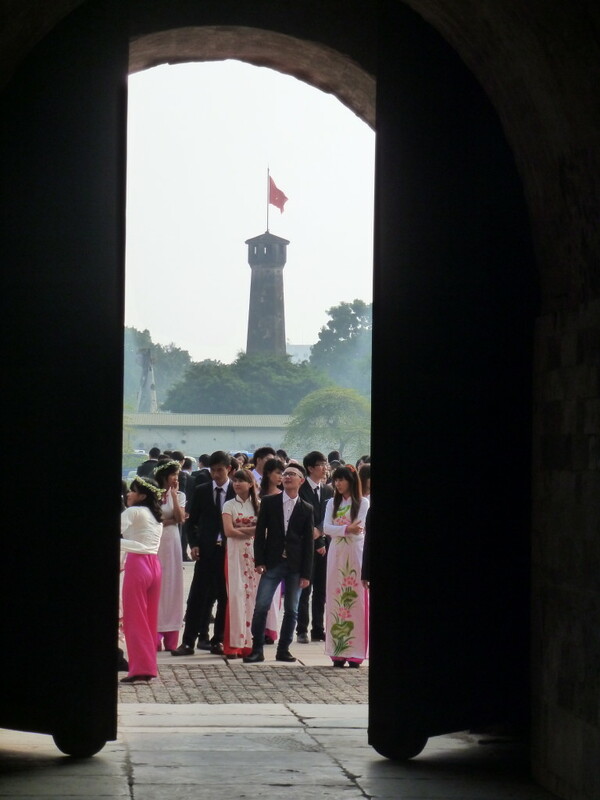 Built in 1812 during the Nguyễn dynasty, the tower, unlike many other structures in Hanoi, was spared during the French colonial rule (1885–1954) as it was used as a military post. If you visit during graduation season, October-November, you’ll get a chance to see the students who come to have their pictures taken. 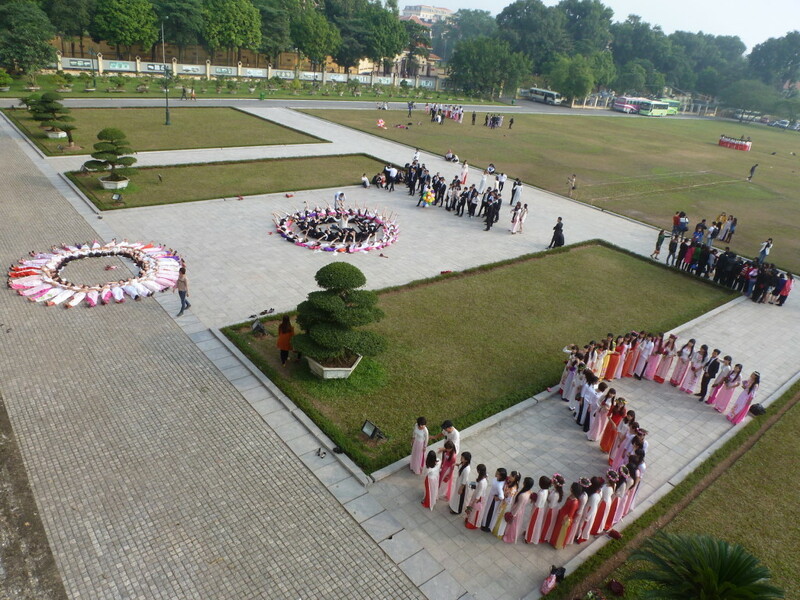 I loved seeing the young women in their gorgeous traditional garb, called ao dai. I was quite intrigued with the D67 tunnel and house, built in 1967 and found north of Kinh Thien hall. 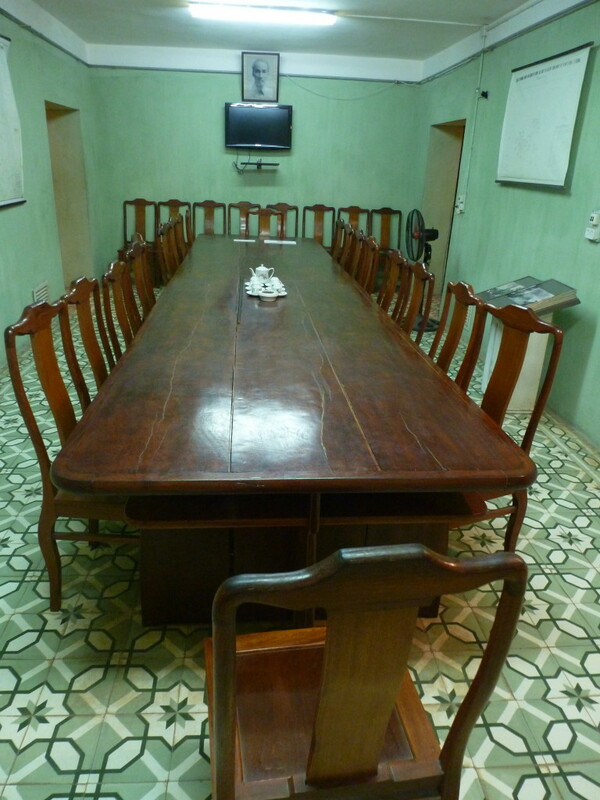 From 1954 to 1975, the North Vietnamese military command (Vietnam People’s Army) under General Giap, had its underground headquarters here. A connecting underground tunnel allowed for emergency evacuation in case of an attack. It was eerie to wander the halls and see the furniture and communications equipment used in the fight against the South and the United States. One of the most restful spots in the Citadel is Hau Lau, also known as the Princess’ Palace. 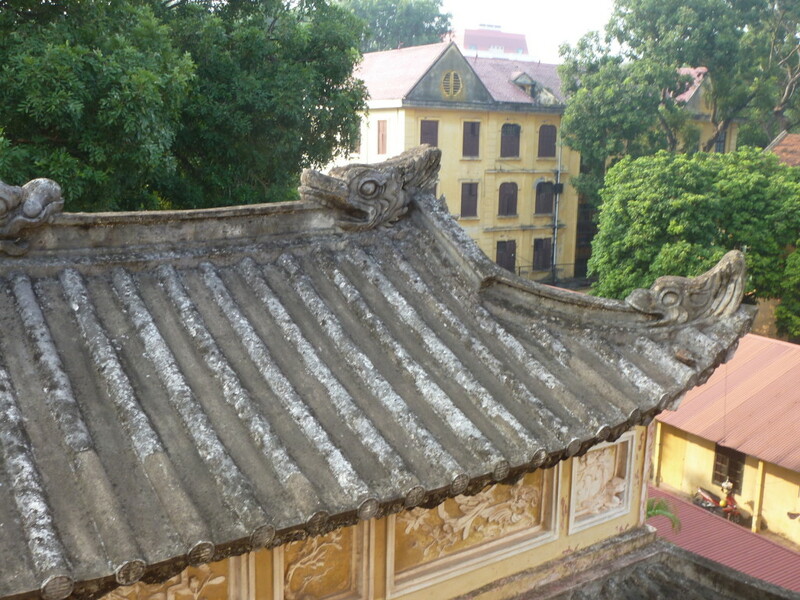 Originally built in 1821 during the Nguyen Dynasty for the queen and princess, it was later the residence of imperial concubines. It is a mish mash architectural styles, since the French rebuilt it, but I loved the Vietnamese roof with its crescent-like bladed corners. 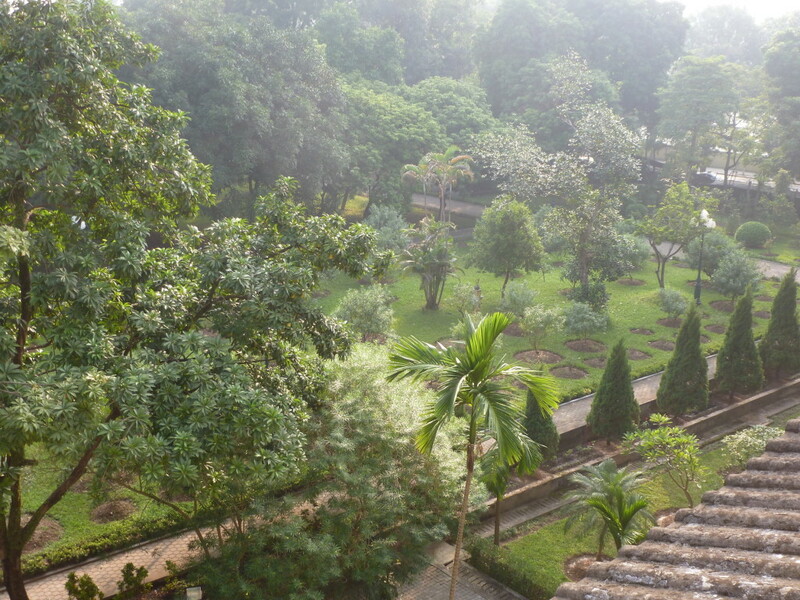 Hardly anyone comes here, so it’s a perfect place to chill and enjoy the gardens. I don’t eat a lot of red meat at home, but when in Rome…or I should say, Alberta, I do. Striking out from the delicious Fairmont Banff Springs Hotel, I was determined to see what else the mountain town had to offer. 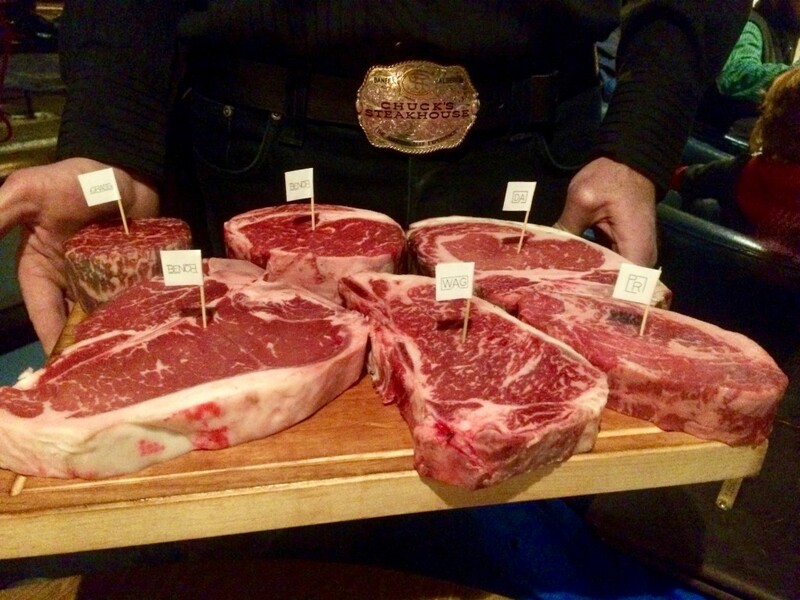 If you want to know where the beef is on Banff Ave., go to Chuck’s Steakhouse. Shortly after sidling past the meat cooler and sitting down, our server showed us a wooden board with different types of beef on the menu, from waygu to prime cut. Our group’s choice was to share the Taste of Alberta platter with slices of waygu, grass-fed tenderloin and a prime cut. This was casual fine dining and we learned that not only did Benchmark Angus Ranch provide all their top menu items, but the third generation of Muntons, who owned the operation, was sitting a table down from us. Good to know they approved. We did, too. Chef Tomas Bustara even agreed to pose for a picture. The next day, a spirited prelude to lunch was had a Park Distillery. 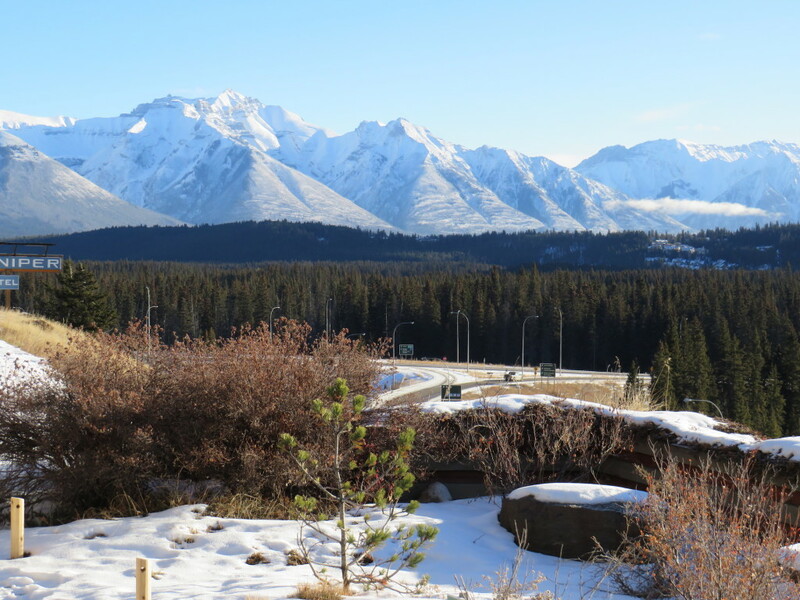 Located on Banff Ave., the main drag, it is the only distillery in a national park in Canada. 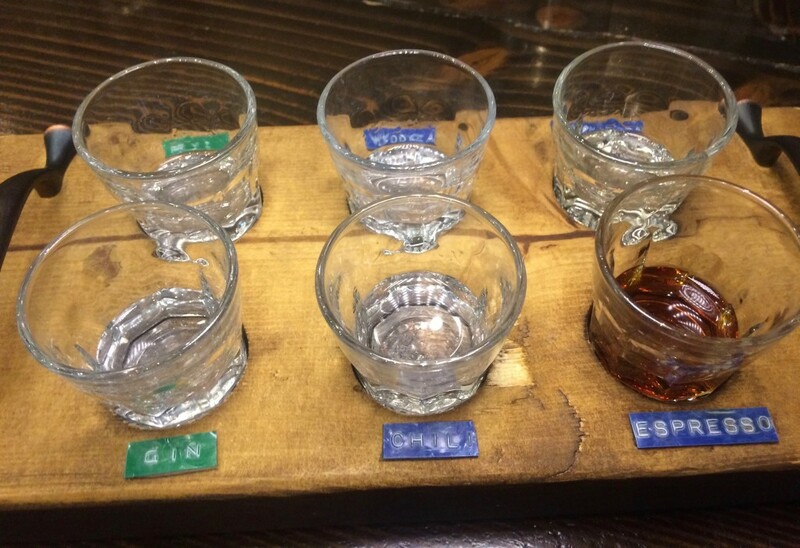 Dylan Liebe, the bartender, laid out a flight of gins and vodkas, plus an unaged, clear rye. The gin used typical botanicals – juniper, coriander, lemon peel, orange peel, angelica, orris root, licorice and cinnamon – but added at top note of spruce tips. My favourite spirit was the vanilla flavoured vodka…very smooth. They also do pre-made, bottled cocktails that are barrel aged in ex-bourbon casks for six months, available in their little off-sales shop. 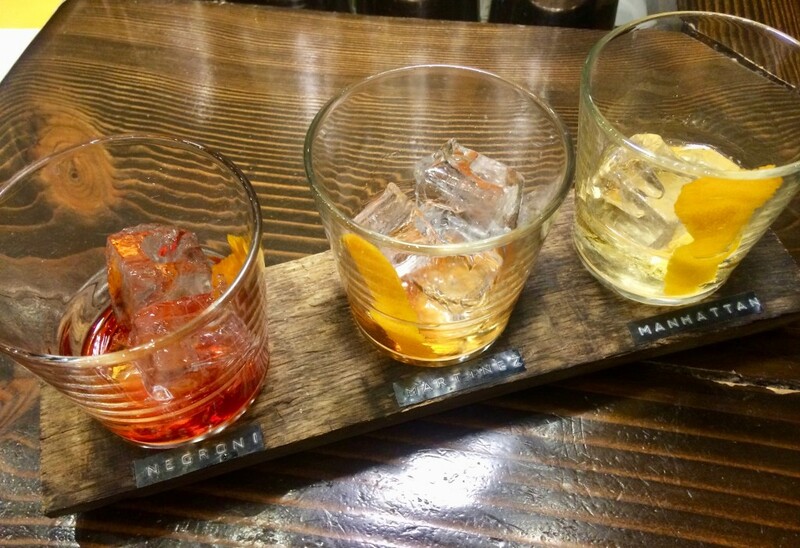 The Distillers Series included a Negroni, Glacier Manhatten and Martinez. 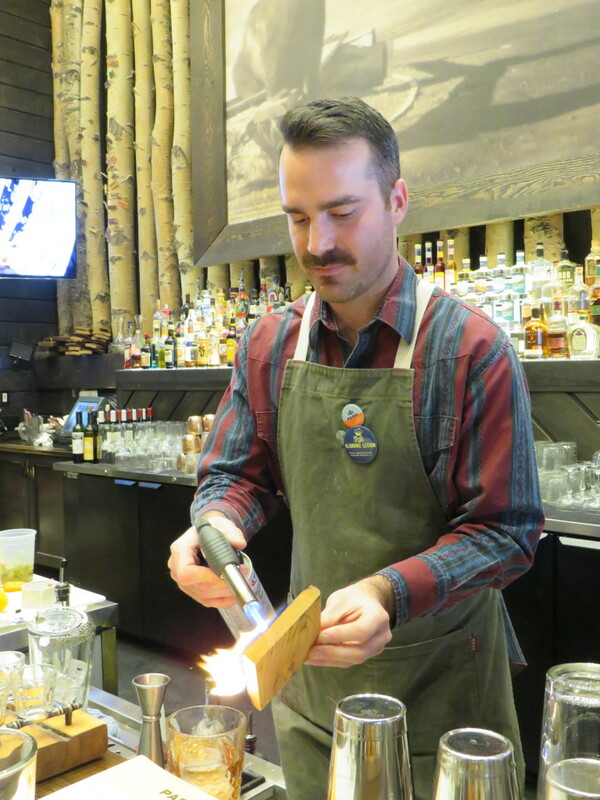 I was most intrigued with their Observation Peak (not pre-mixed), a cross between an Old Fashioned and a Manhattan that Liebe made with rye whisky, dark rum, dry Curaçao, amaro Montenegro, a touch of syrup and then, after whipping out a blow torch, he topped with a smoking cedar square. Now that’s campfire! 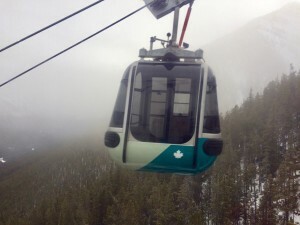 Just a tad wobbly, we headed up the gondola to the top of Sulfur Mountain and Sky Bistro. 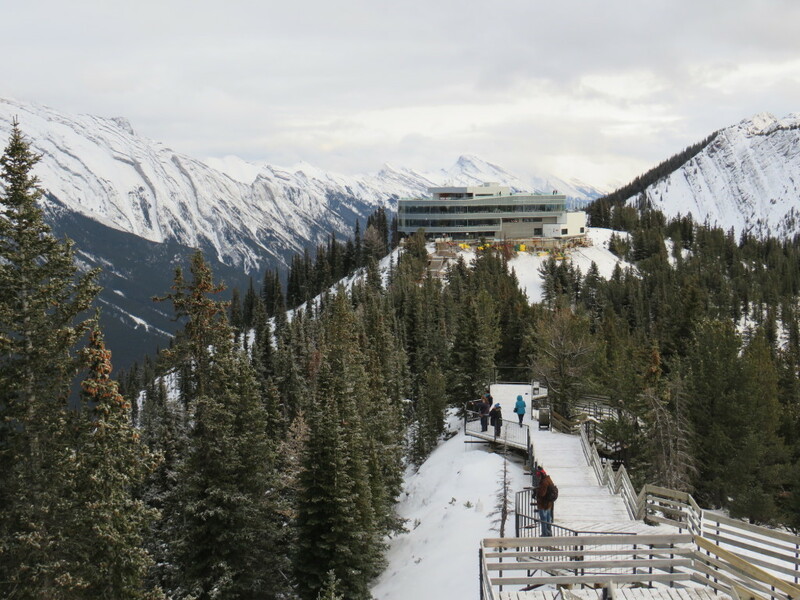 At 7,500 feet, the views were stupendous – the generous outdoor wooden walkways and scanning scanning platforms put a shine on the $25 million renovation done two years ago. 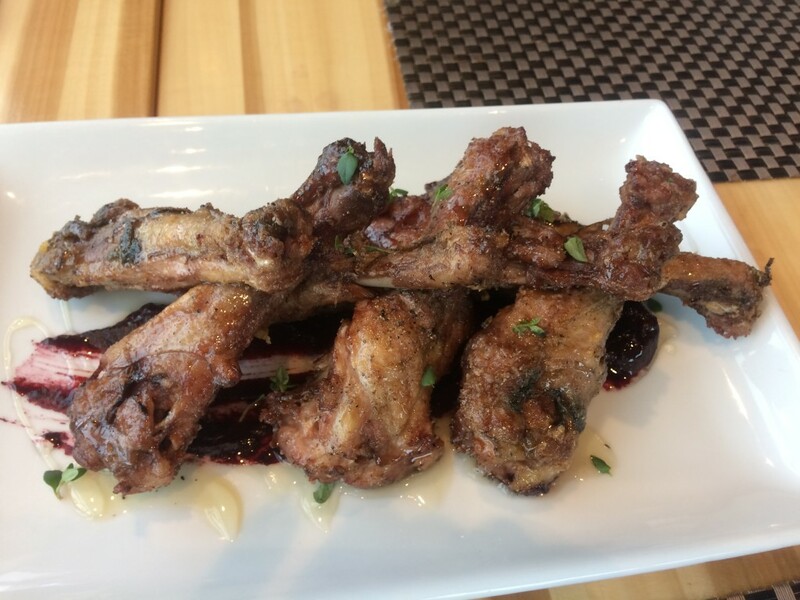 Anthony Mason, the restaurant’s senior sous chef, greeted us with a big smile and suggested we start lunch with the duck wings. 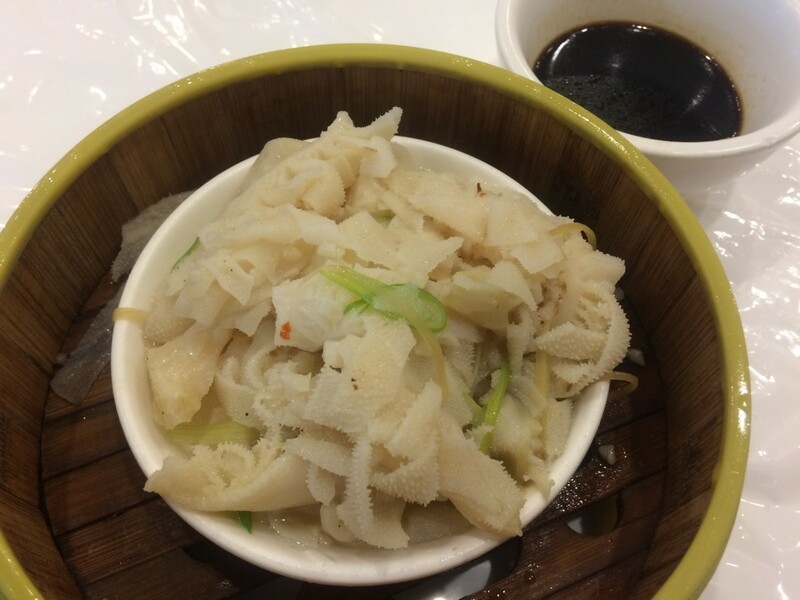 Easy to make a meal out of. Butternut squash salad, and fries and aioli followed, washed down with a smooth Liquidity Vignoner. 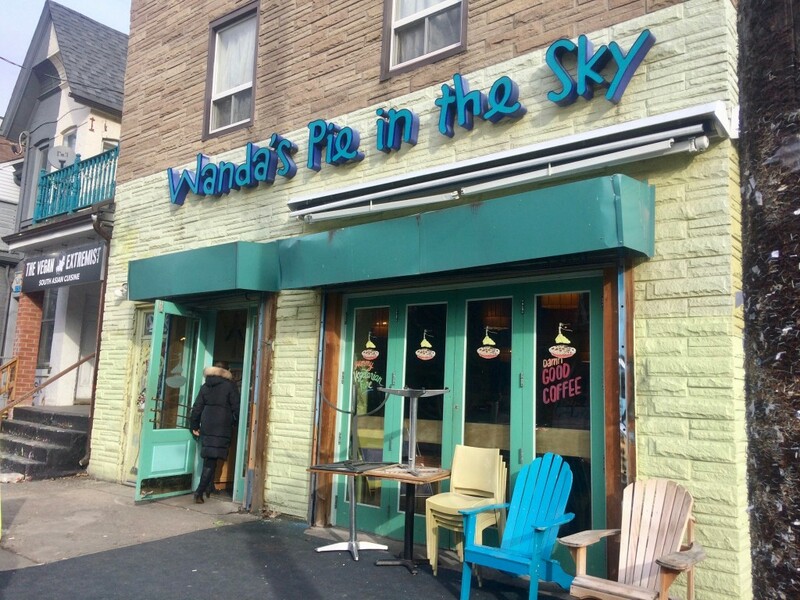 Tanya Otis, a public relations consultant with the destination told us Sky Bistro does regular wine-ticketed events that take over whole bistro. Costs are $149 for seven courses, paired with wine. Sounds like a good deal. 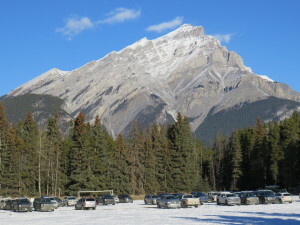 “In the summer they use the terrace above for a sunset festival called Mountain Top Yoga with beer and champagne. Nice way to ease into downward dog. 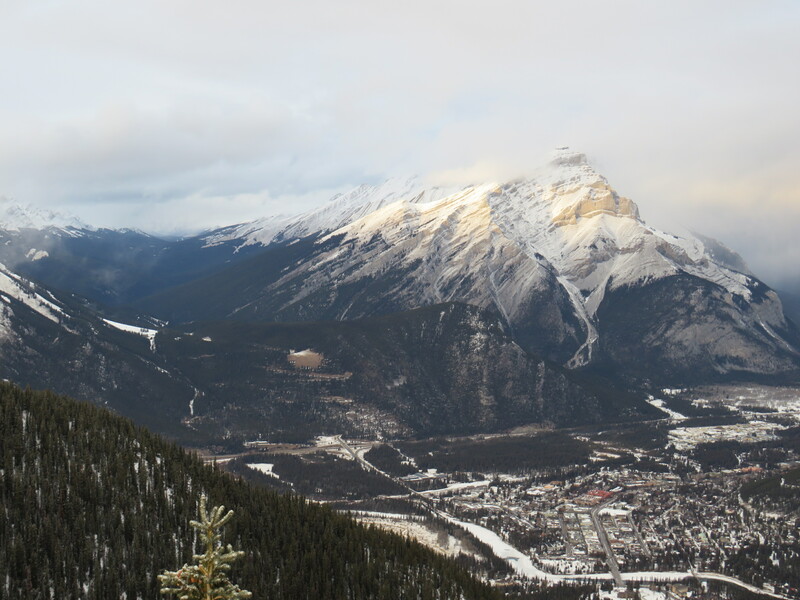 I had been to the Banff Centre for the Arts more than 20 years ago, and it sure looks different now. Twenty per cent government funded, this unique university facility sits on 42 acres and features an art gallery with visiting exhibits and commissioned work. Artists of all genres come to work in studios, take part in workshops and spend time getting creative. Along with their lodgings, there are 217 guest rooms open to public. 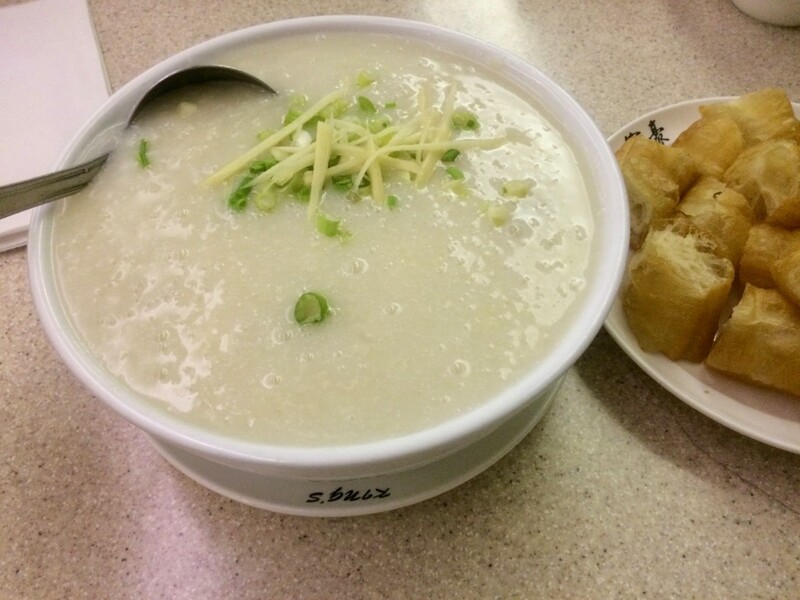 There’s no need to go off campus to eat, especially if you are looking for fine dining. 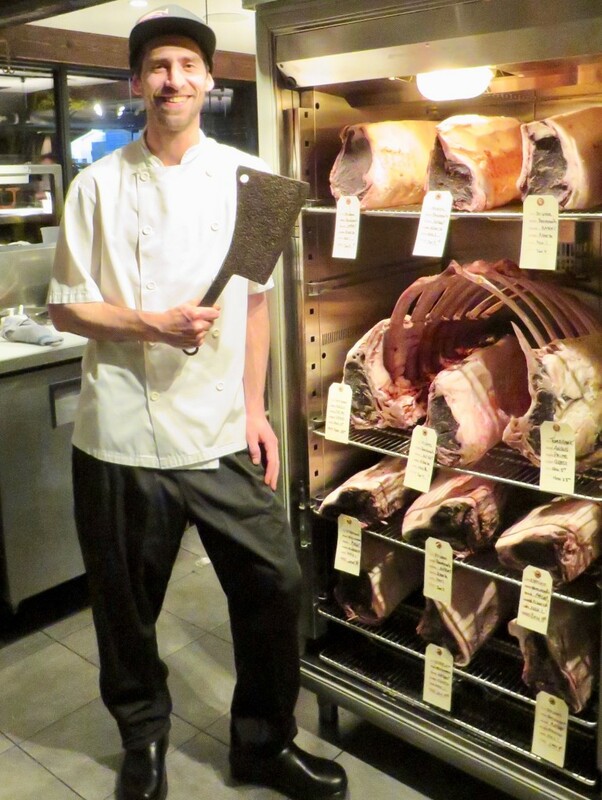 Three Ravens opened nine years ago and Executive Chef Sebastian Tessier is proud to source mostly from local farmers. “We strive to source seasonal foods that thrive in the Canadian climate. 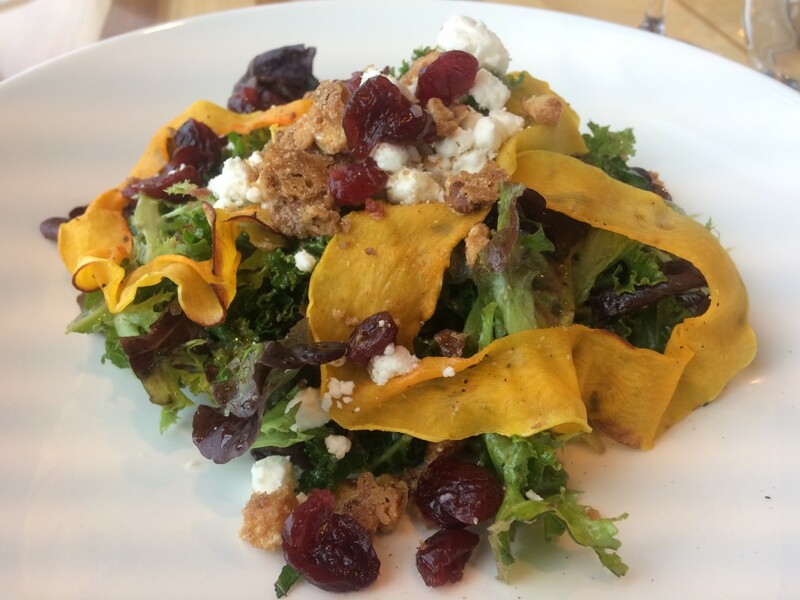 We source Alberta ingredients and are conscious about sustainability because the food just tastes better,” he explains. 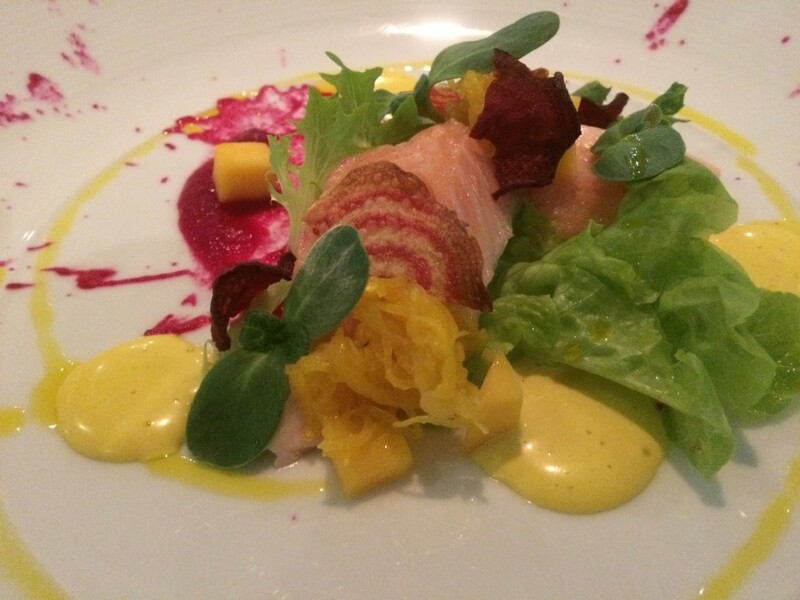 We started with smoked Alberta trout, with local winter greens, smoked aioli, beet chips, and Banff Centre grown sunflower shoots (from their cultivar). 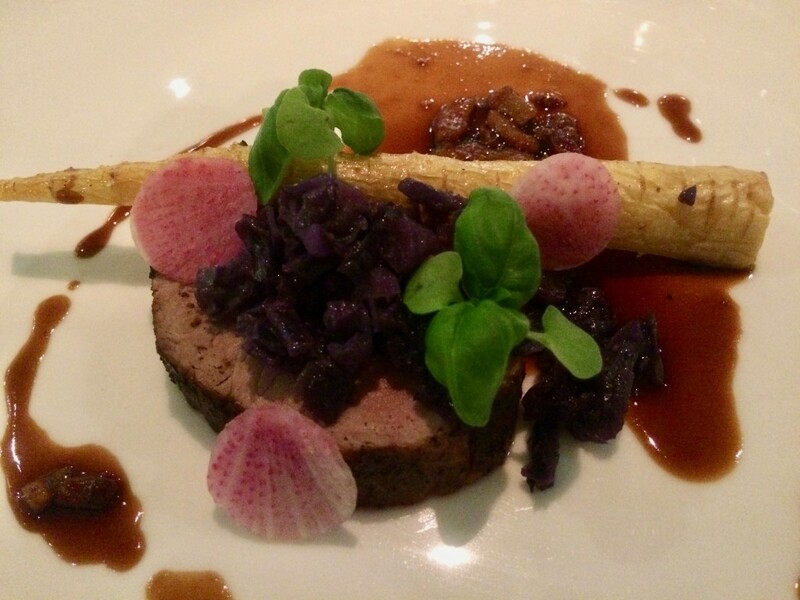 First course was pork tenderloin, roasted organic parsnips, charred organic red cabbage, topped with a bacon and stout jus. 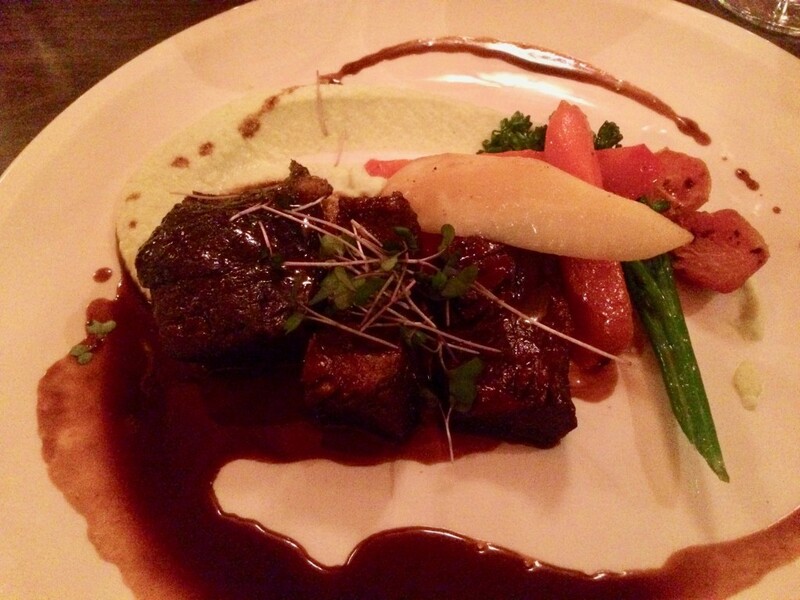 The main was juniper rubbed elk tenderloin, on braised Alberta beef cheek, with local brown butter ricotta gnocchi, sautéed oyster mushrooms, and maple glazed organic carrots. With just a sliver of room left, I dipped my spoon into a delicious Saskatoon berry compote with yogurt ice cream and FallenTimber mead reduction. Our paired wines were all from British Columbia, Tinhorn Creek Chardonnay, Stoneboat pinot noir and Gray Monk cabernet sauvignon. 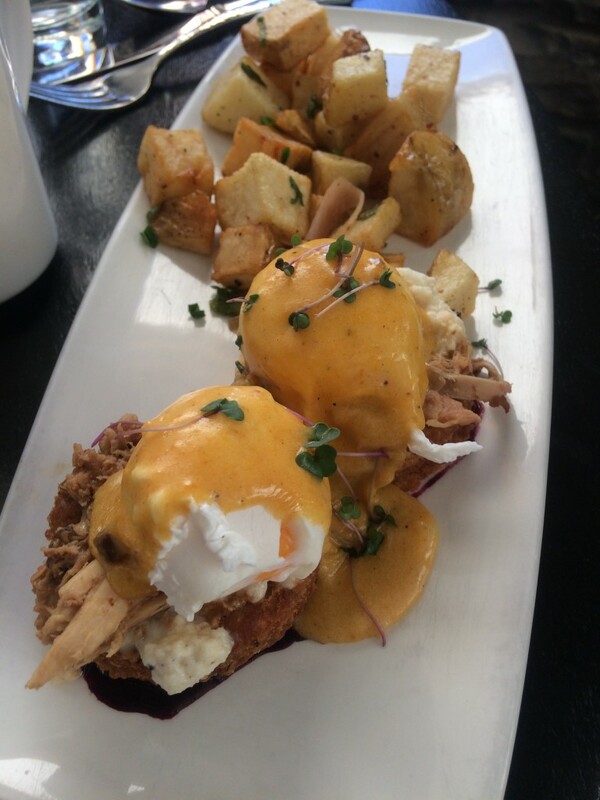 Believe it or not, I was hungry the next day and brunch was at Juniper Bistro. 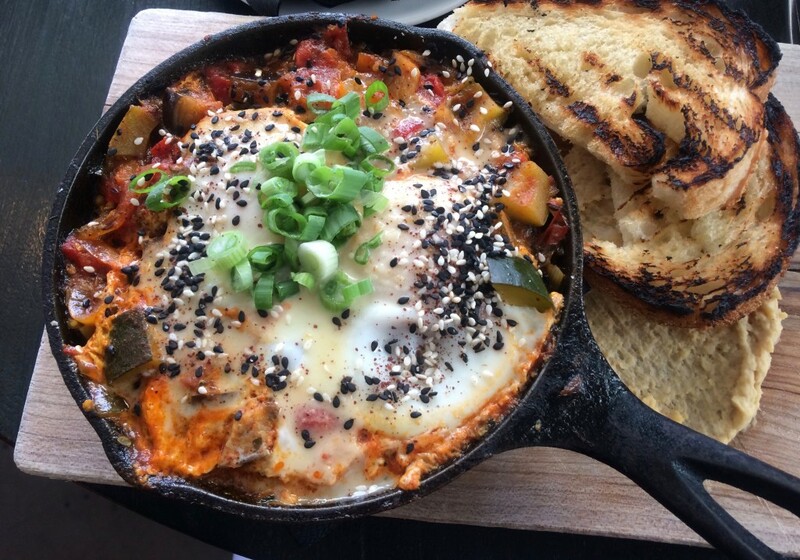 My friend Elizabeth tucked into a Juniper Benny with bannock, buffalo mozzarella and braised rabbit while I enjoyed a tangy Shakshuka with tomatoes, onions, eggs and touch of za’atar. Our food was matched royally with stunning mountain views. 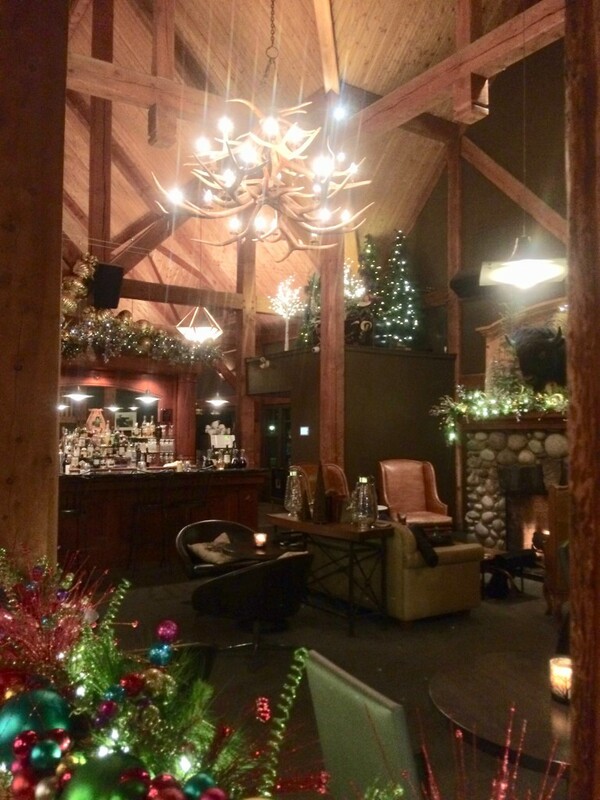 My final meal (before falling into a deep food coma) was at Sleeping Buffalo Lodge &Restaurant, a property belonging to the Canadian Rocky Mountain Resorts family. It was a Chef’s table event, a series that is held on Fridays in the winter. 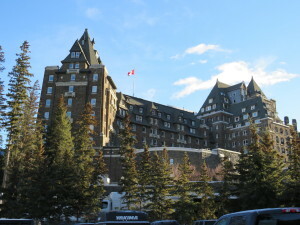 Although I was staying at the Fairmont Banff Springs Hotel, our kind host Brad Royale, Canadian Rocky Mountain Resorts’ wine director, told me ticketed guests receive 40 per cent of their room rate when they attend. Brad rolled out the red carpet for us, pulling all sorts of older vintages from his cellar. 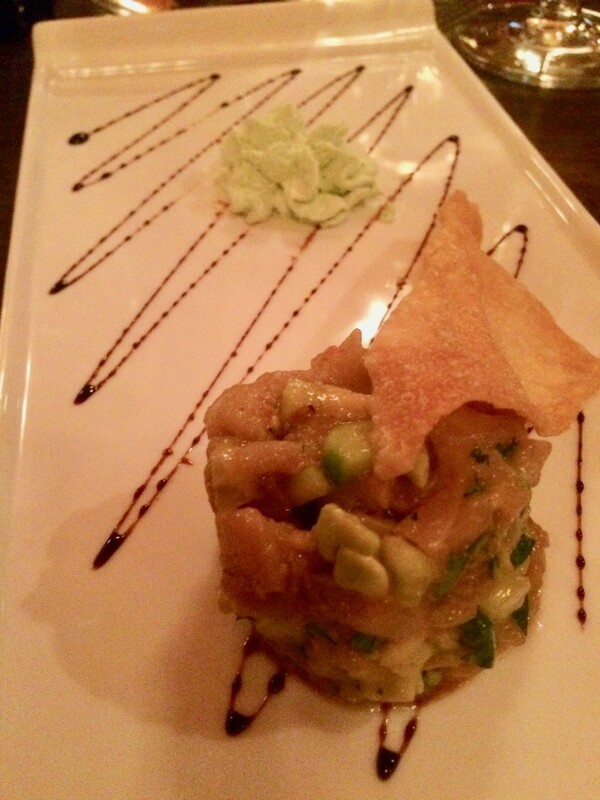 Accompanying our starter of tuna poke, with scallions, cucumber, roast sesame, crispy won ton, avocado, and wasabi foam we had a 2003 Tahbilk Marsanne, 1927 Vines (Victoria, Australia). Soft and easy with a slight tang of mineral, it set off the tuna beautifully. Pulled duck confit came next with a double smoked bacon butternut squash risotto, baby heirloom tomatoes and arugula. It was paired with a 2006 R. Lopez de Heredia Vina Bosconia (Rioja, Spain) that was hearty enough to offset the richness of the duck. 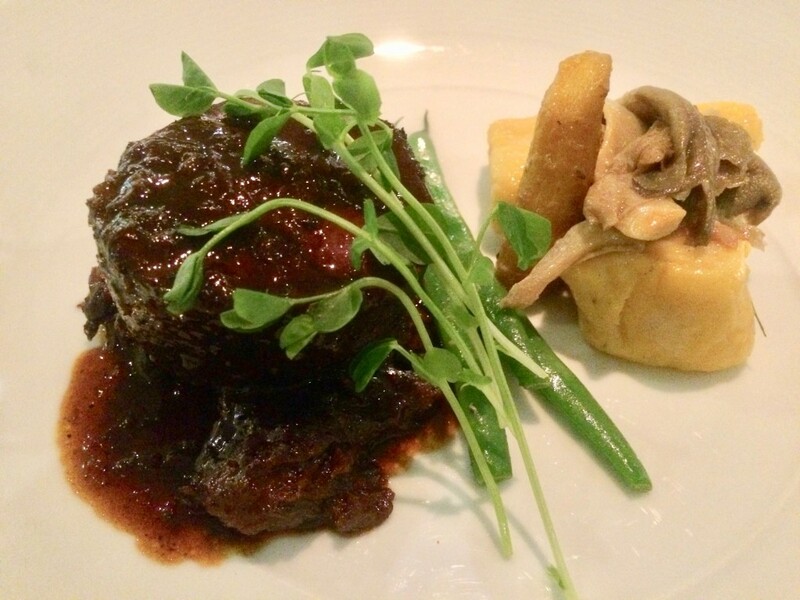 Our main dish was bison short ribs with potato and celery root puree, roasted baby beets and morel mushroom thyme glaze. I was eager to try the bison, since it was from Canadian Rocky Mountain Resorts game ranch south of Calgary and I wasn’t disappointed. 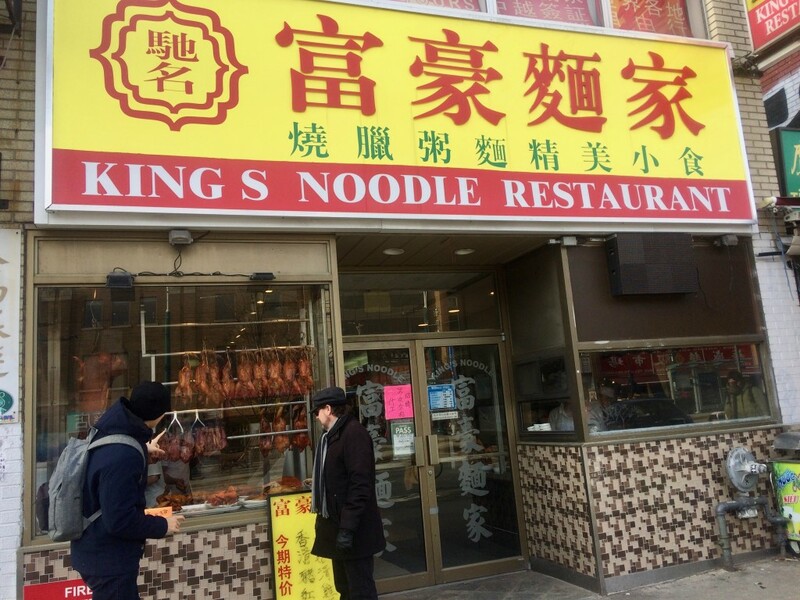 The meat was flavourful and falling off the bone. The wine was a 2004 Domaine de la Janese Chateauneuf du Pape Vielles Vignes (Rhone Valley, France). 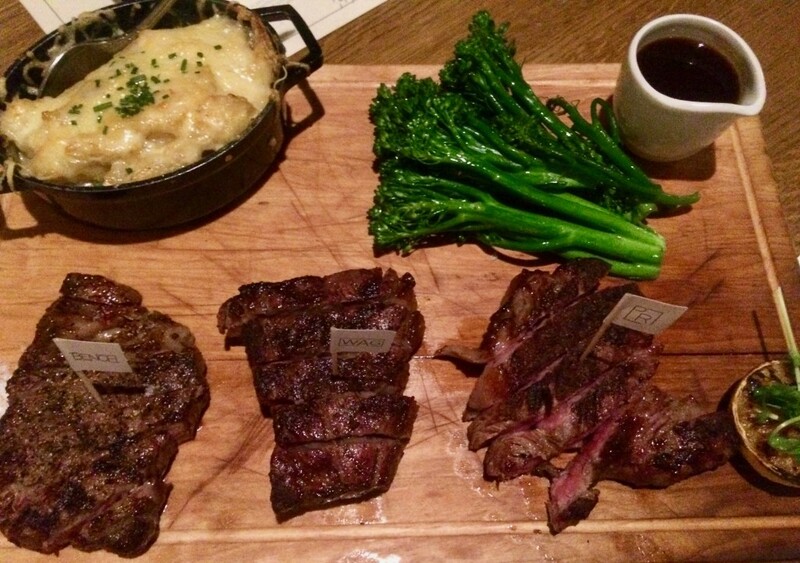 Of substantial body, it paired well with the heavy meat. 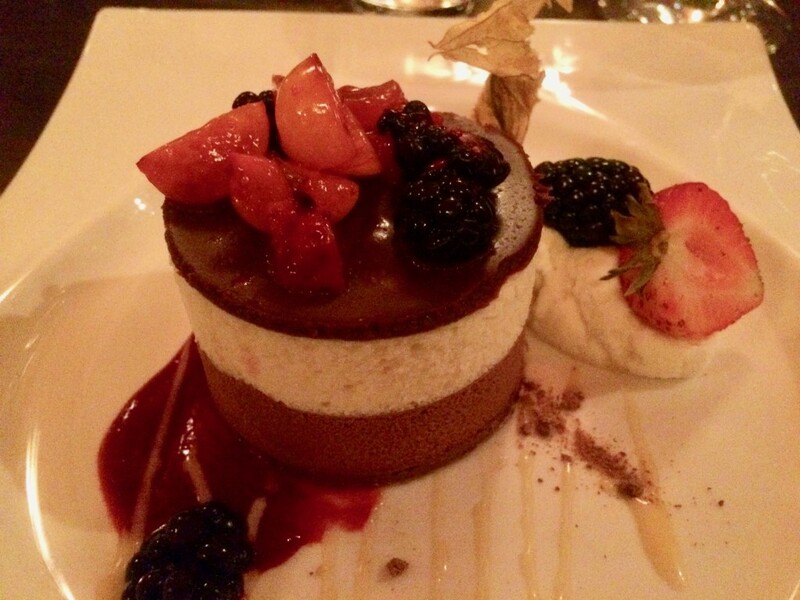 I can never resist dessert, even when full, so I dug into the triple chocolate mousse with bourbon berries and raspberry black pepper sorbet. Wow. Rich and creamy and delightful with a 2005 Quinta Do Noval Silval Port (Douro Valley, Portugal). 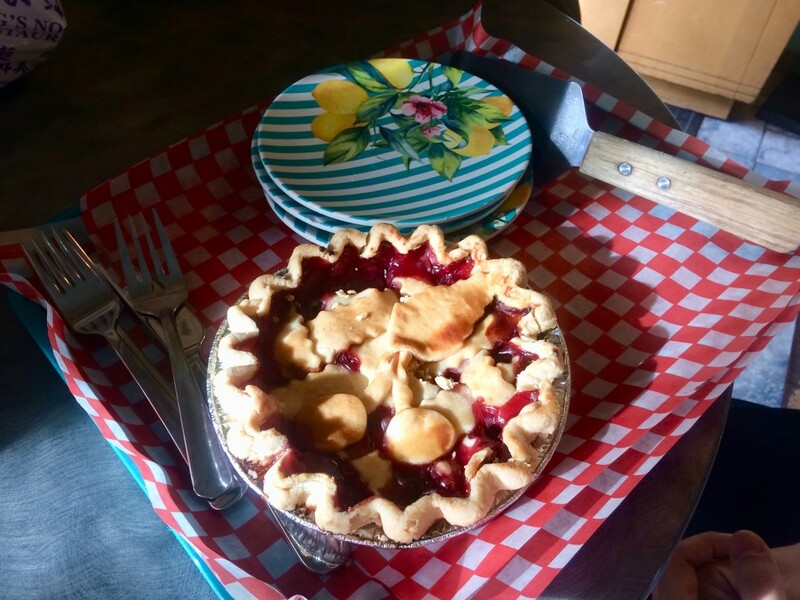 In summary, yes, Banff offers mountain adventure, but the quality of its culinary offerings can easily make the summit of any foodie’s priority destination list. And me? I’m ready for a juice cleanse. 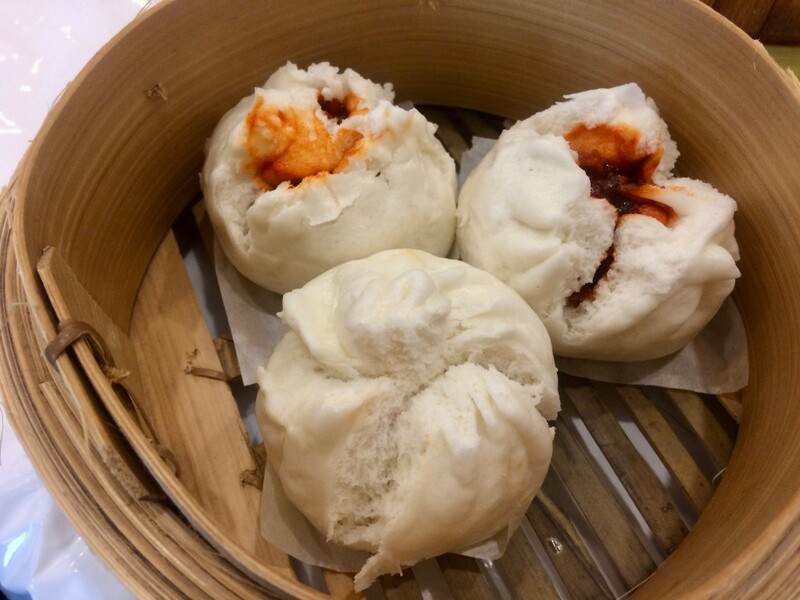 I knew Banff’s mountains were jaw-dropping, but I had little knowledge of the culinary treasures to be found there until visiting this November. It all began in the Scottish baronial castle known as the Fairmont Banff Springs Hotel. 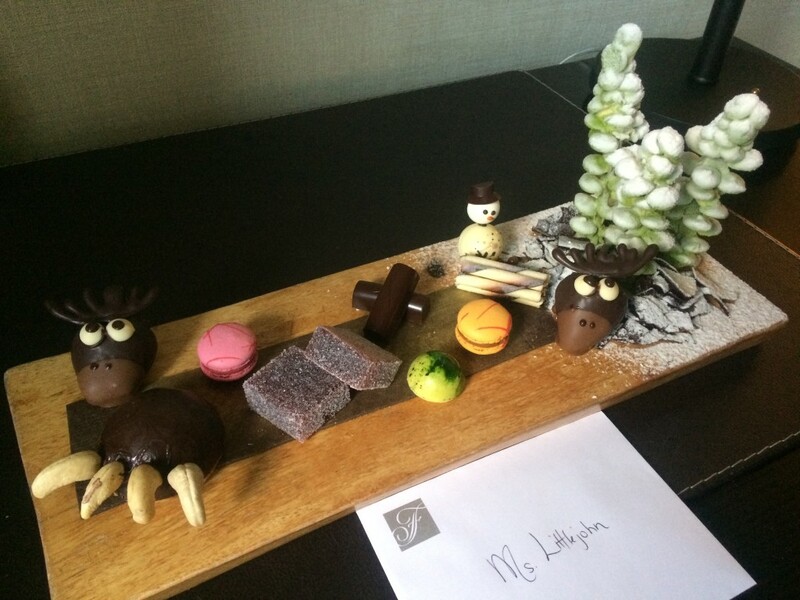 After checking into my room and gasping at the gorgeous view, I looked down at the desk and this is what welcomed me! Yeesh. A very good start. 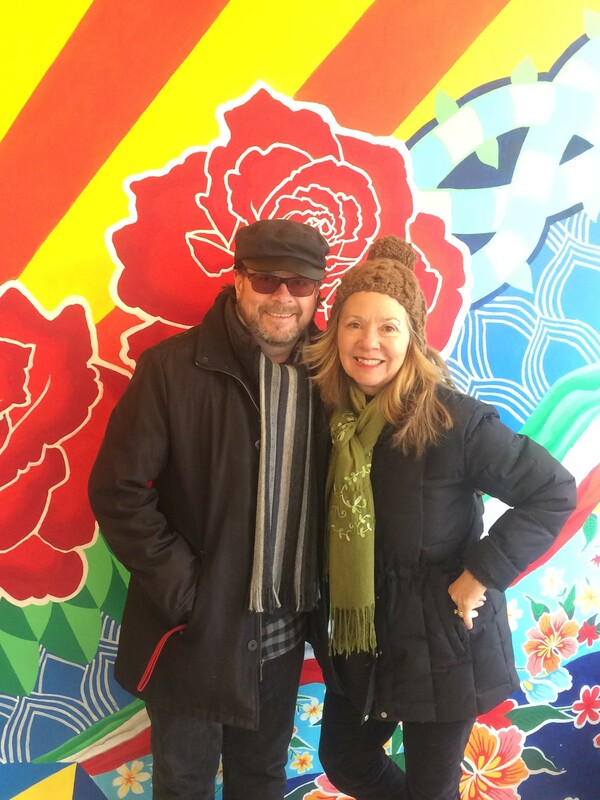 Wanting to explore the hotel’s many foodie options, I signed up for the “Eat the Castle” walkabout, led by Alberta Food Tours president and CEO Karen Anderson. 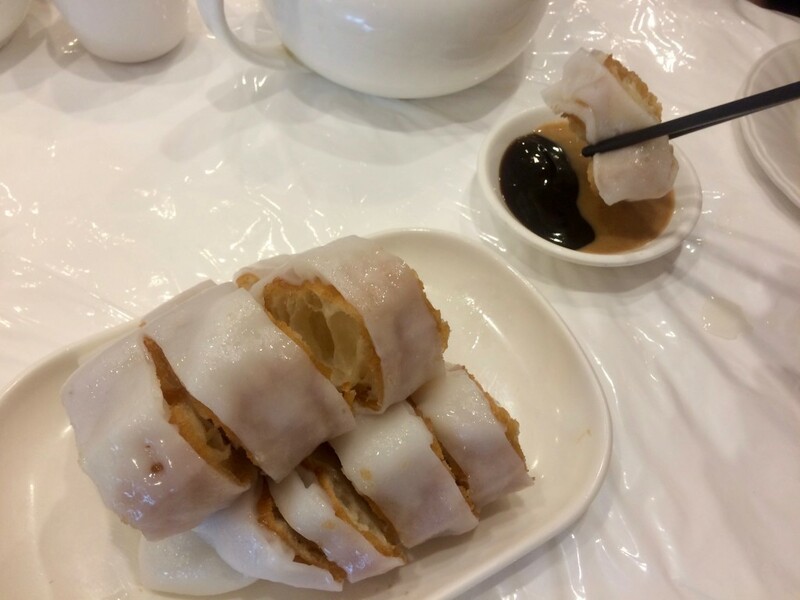 “This is a history, art and architecture tour meets food tour,” she explained of the $175, two-and-a-half-hour indoor expedition. 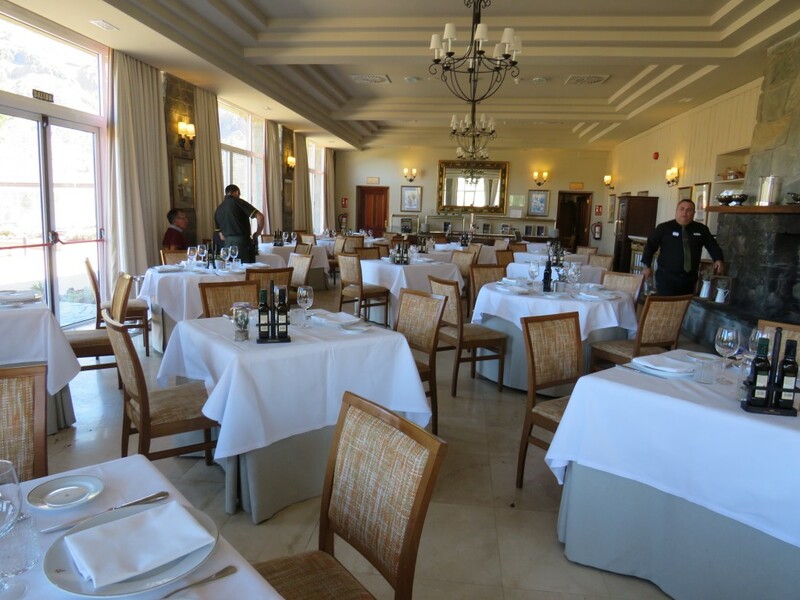 The tour is billed as sampling both food and beverages in four of the hotel’s onsite noshing venues. My group was also lucky enough to have the hotel’s executive chef Robert Ash join us. 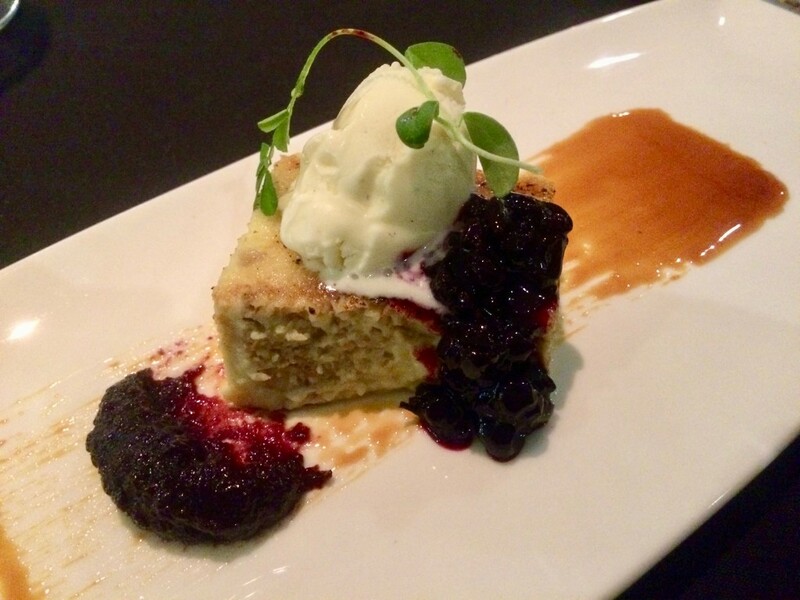 Ash had just joined the Fairmont four months prior (previously he had been resort executive chef for Omni Hotels in Orlando) and his dedication to every detail was deep. 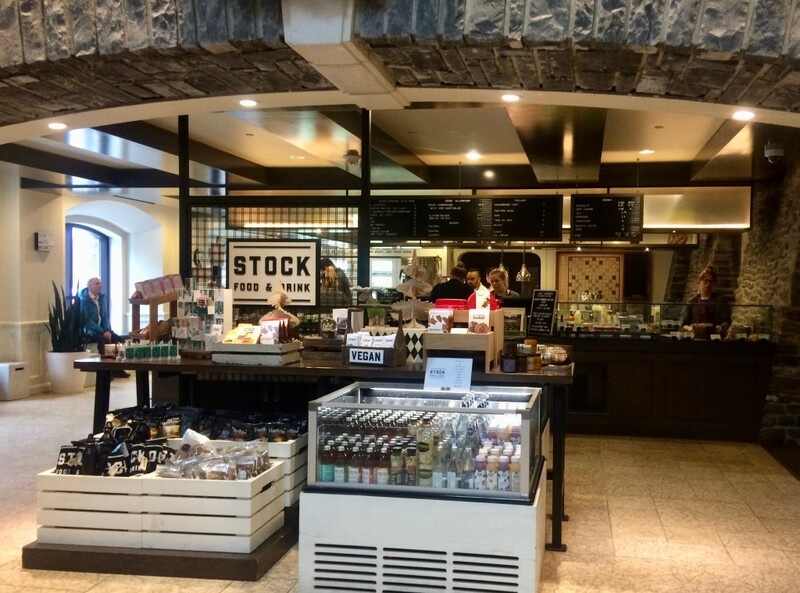 Our first stop was at Stock Food & Drink, a breakfast, lunch and snack emporium off the lobby. 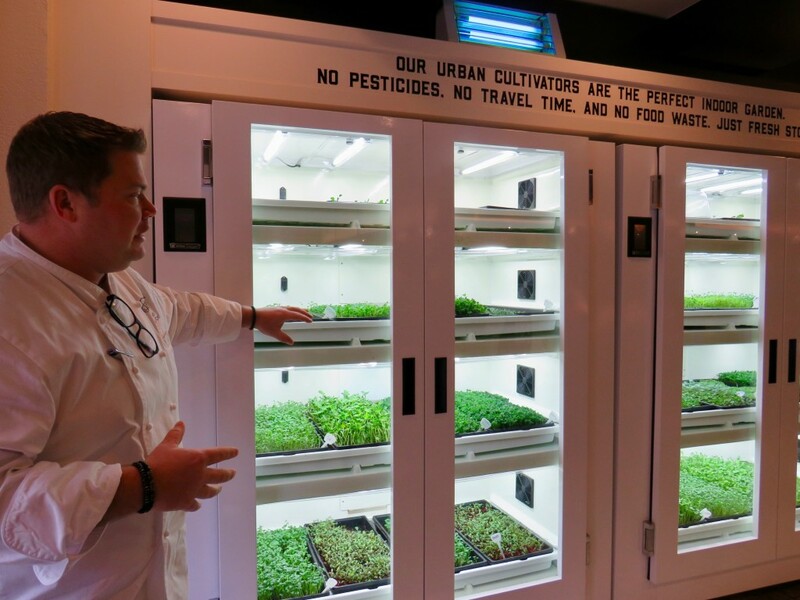 Robert stopped in front of the cultivar, a set of temperature-controlled wall cabinets with grow lights and trays of tiny seedlings. 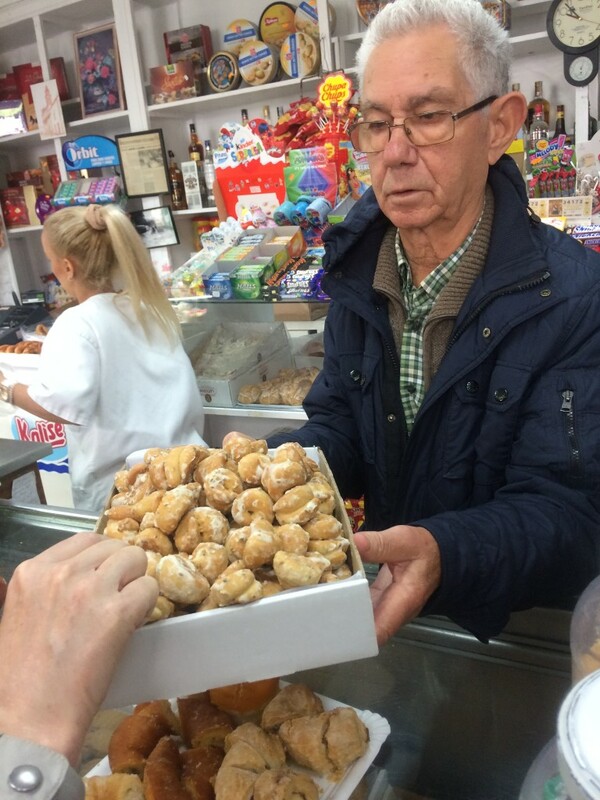 “What would you like to try?” he asked. I opted for a thumb-sized sprout of kale. 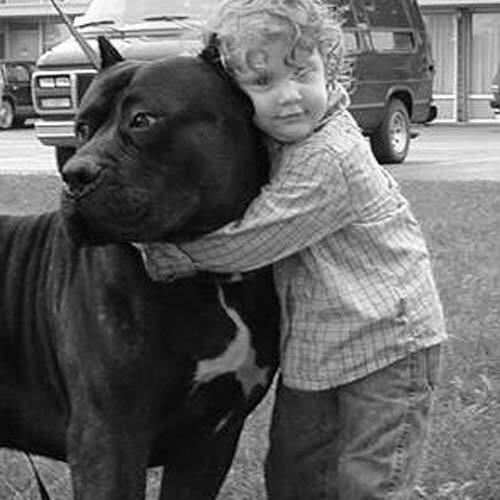 So tender! Other trays contained an array of tiny greens including cabbage, peas and sunflowers. The micro-greens are used in all 12 of the hotel’s restaurants and food outlets. Robert shared a bit of culinary data – the hotel sources from 25 farms in the area, there are 25 chefs in the apprentice program, 150 chefs in total and they serve between 1.5 and 2 million meals a year. Wow. 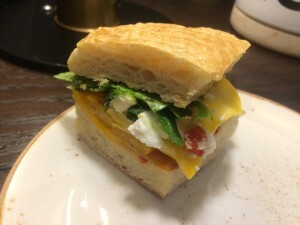 Sitting at a long table in Stock, we sipped a glass of locally made Grizzly Paw Power Hound blonde ale and nibbled on a variety of sandwiches including goat cheese and roasted peppers, smoked meat and house-cured bacon and tomato. 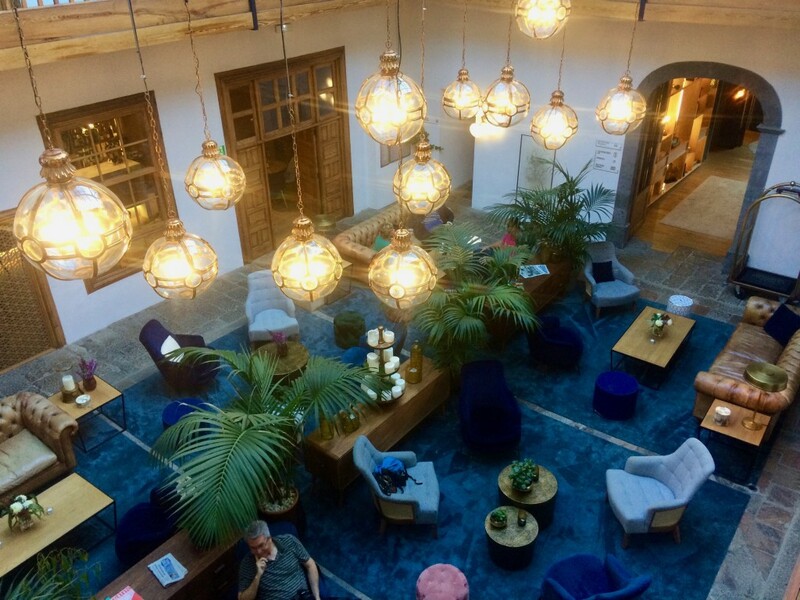 “Ninety per cent of what the hotel serves is made in house including sausages and charcuterie, bread, pastries, pickles and vinegars. We specialize in local sustainable cuisines, have an in-house butchery, and are part of the Ocean Wise Seafood program,” Ash told us. As we made our way to the next sampling, Karen gave us a bit of hotel history. 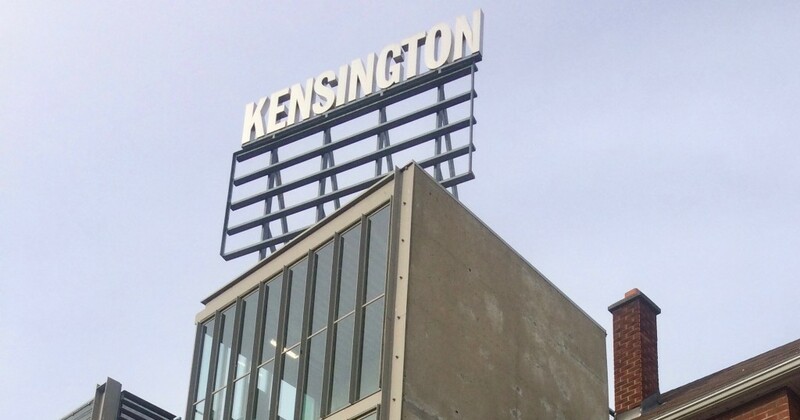 The building was the brainchild of Pacific Railway CEO George Stephens who brought in architect Cornelius Van Horne. Van Horne designed a series of gorgeous CP hotels back at the turn of the last century that connected the railway and the country and this was his second (Hotel Vancouver was the first). The Banff Springs Hotel opened in 1888 and originally was a wooden structure (and built backwards to plan!). In 1926 there was a fire and in 1928 it was rebuilt, this time of brick and stone (Rundle Rock from Mount Rundle, overlooking the hotel). Karen pointed to a Latin crest woven into the lobby rug, “It spells out the hotel’s motto ‘Semper Eadem,’ Always the Same.” There have been a few additions and changes to the 754 guest-room hotel over the years, but the exterior facing of Rundle Rock has always been maintained. 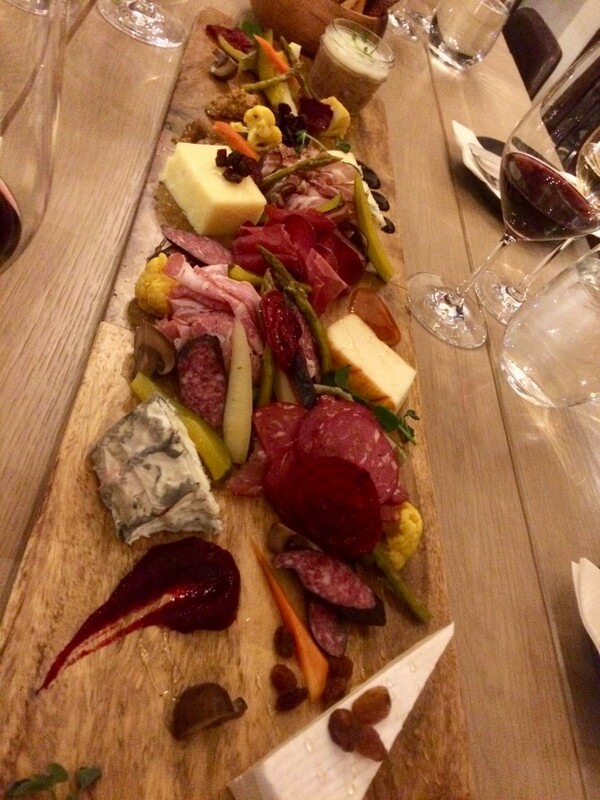 At Grapes, on the mezzanine-2 level, we tucked into two boards of charcuterie, smoked trout and cheeses. Grapes chef de cuisine Tait Robinson pointed out the three types of trout, smoked and candied with maple syrup, gravlax and a hot smoked variety with brown sugar and salt. The hot smoked was my favourite. There was also a velvety duck liver pate, elk salami, Canadian camembert with quince jam and bread and butter pickles. All paired with a light white Cote du Rhone. Karen then held up cards with French names of a kitchen team. Chef de Partie, saucier, potager, rotisseur, grillardin, friturier, poissonnier. Who knew? 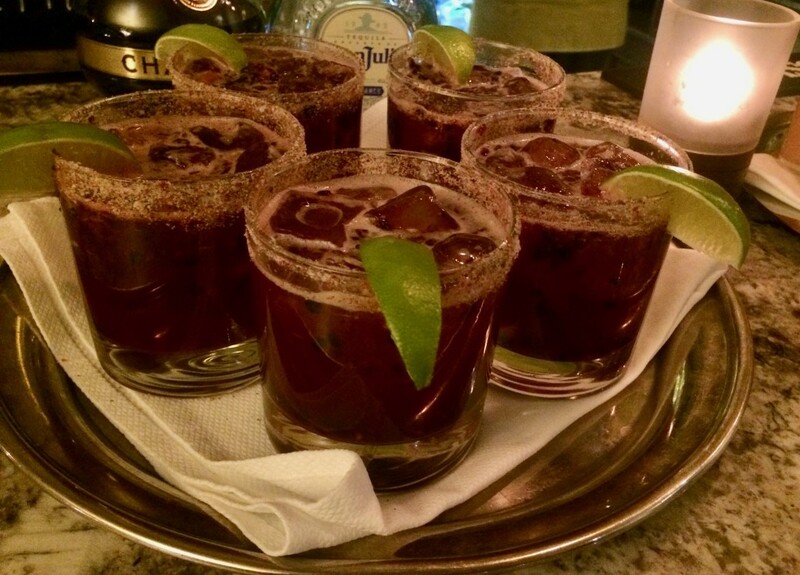 In the 1888 Chop House, we stopped by the bar to sip a deep purple blackberry margarita made with Chambord, Don Julio blanco tequila, lime juice and a pink salt and pepper rim. 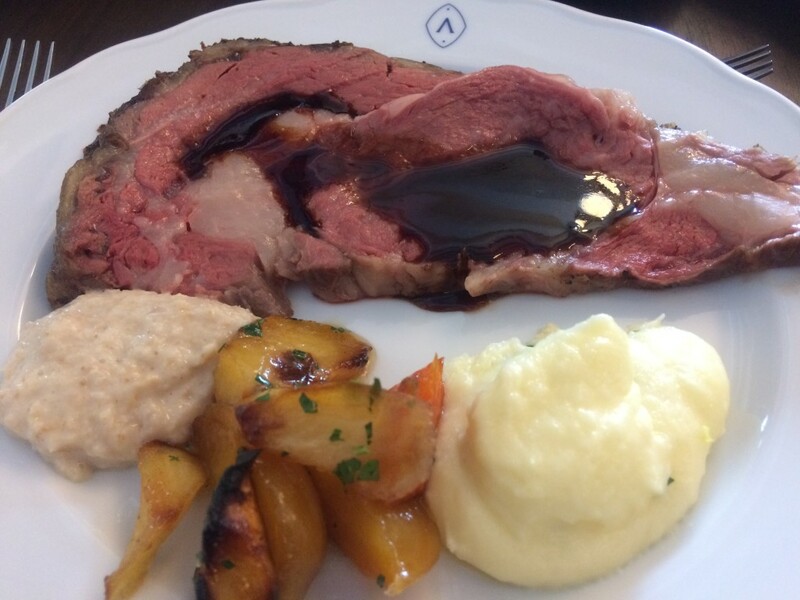 Next was the beef…a huge tomahawk chop and bison tenderloin that was sliced up family style. In Alberta, they know how to do red meat! 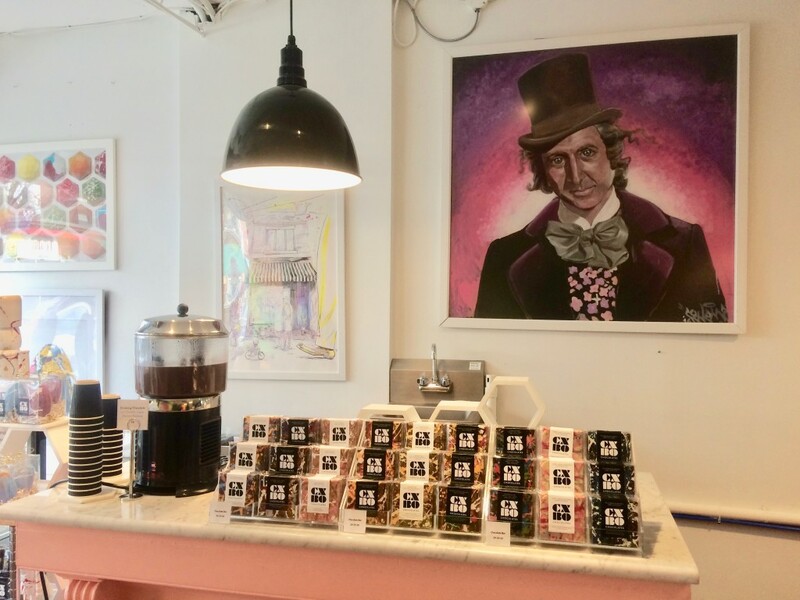 The regular tours usually end with a do-it-yourself profiterole-making session in the Vermillion Room, but Chef Ash, who is partial to sweets, wanted to do something special for our little band of writers and he pulled out all the stops. What does that mean? 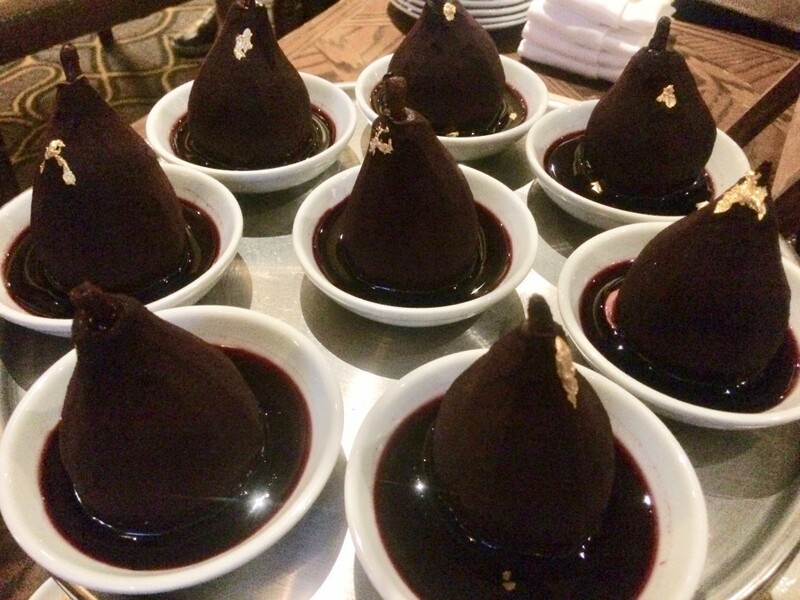 Poached pears dipped in dark chocolate, apple beignets with caramel sauce and ice cream, New York-style cheesecake, cake pops, candied apple pops and a chocolate mousse. A veritable dessert banquet. The next morning was the Banff Springs behind-the-scenes tour, arranged specially for our writers group, starting in the bread and pastry kitchen. OMG. 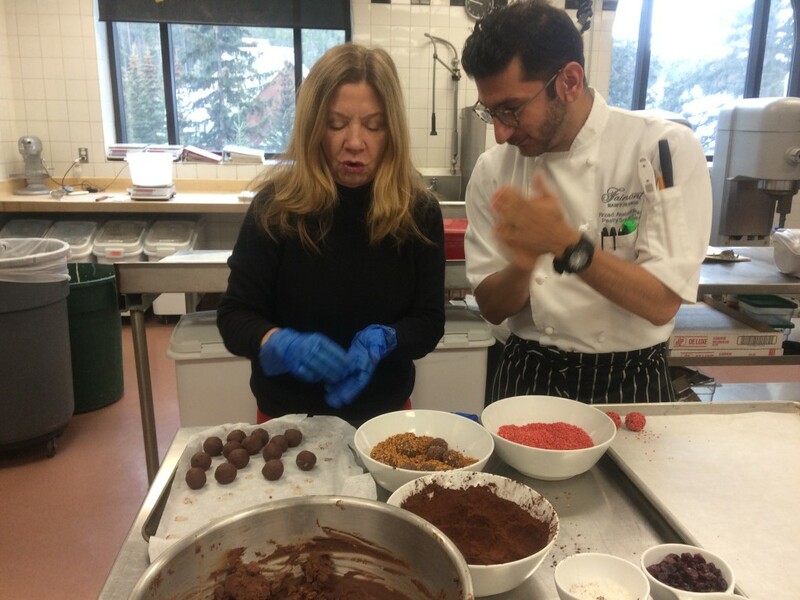 More sugar was just what I needed and I found myself making Grand Marnier truffles at 10 a.m. with chef Pirzad Amalsadiwalla. We learned about the tempering process of heating and cooling chocolate so that it remains solid at room temperature. 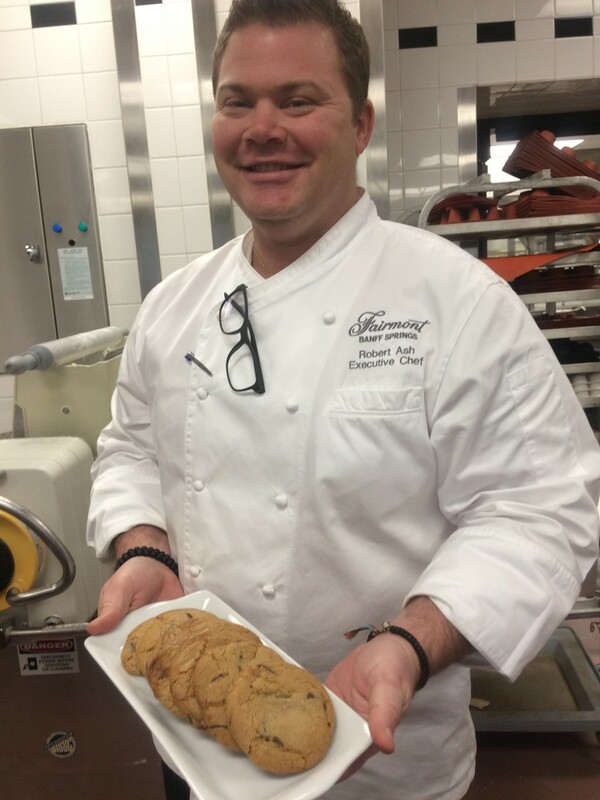 We even tried some of Chef Ash’s chocolate chip cookies, “Made from my family’s recipe,” he confided. The combination of pure butter and chocolate was irresistible. 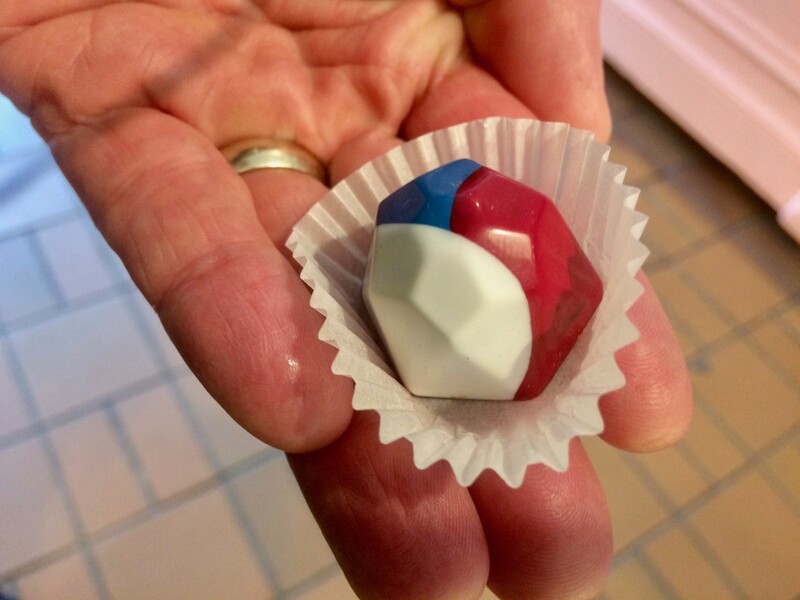 Pirzad told me some of his chocolate bon bons can take a day more than a day to make. He also did a demonstration of dark chocolate bark sprinkled with festive pumpkin seeds and cranberries. “Who doesn’t love making people happy with chocolate?” he responded when asked what drew him to this specialty. 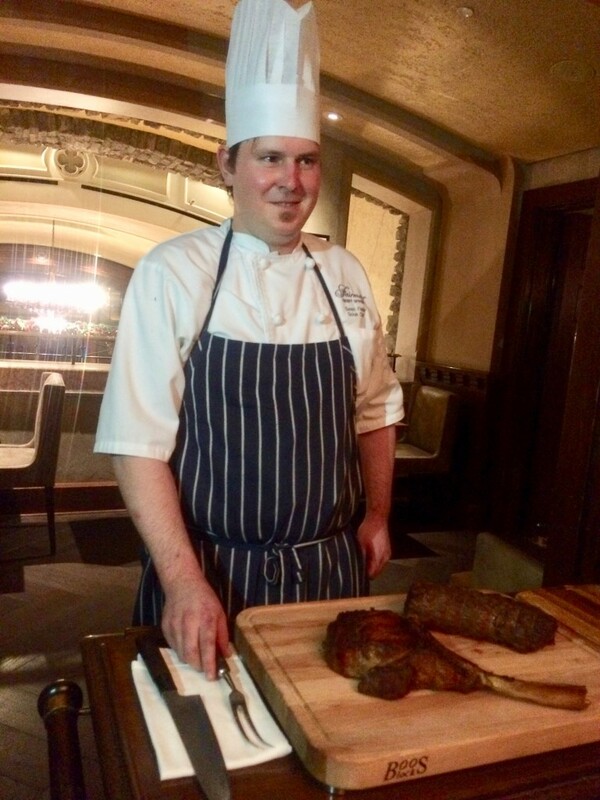 In the hotel butchery we watched meat expert Derek Alexander slice up a side of beef from Benchmark Angus Ranch, outside of Calgary. “We only serve Prime, it’s one notch above AAA,” he told us.That afternoon he was scheduled to stuff sausages. What kind do they do? You name it, chicken, pork breakfast, calabrese, bratwurst, chorizo, and beef. Peeking into the cooler he showed us a rack of Christmas hams and a seasoned tray of wild boar belly. “You won’t find any store-bought deli meats here,” he said. 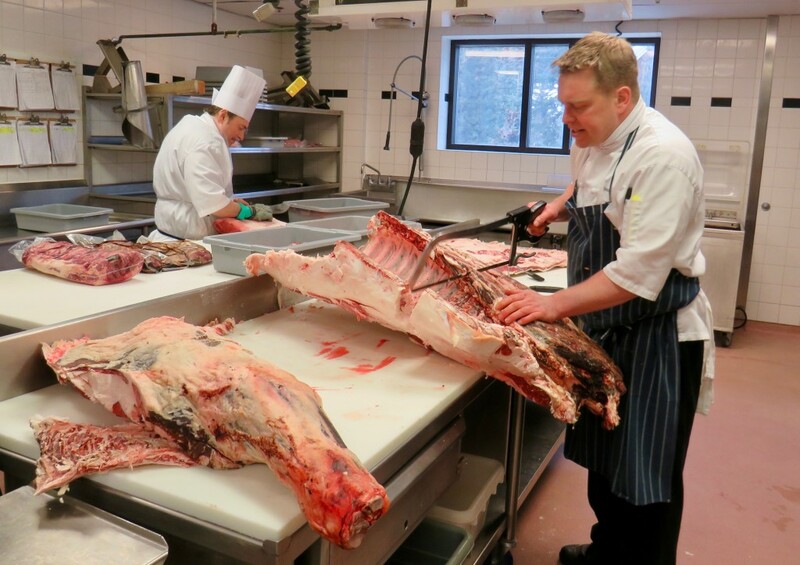 Game meats are on many of the hotel restaurant menus, including farm-raised bison and elk. 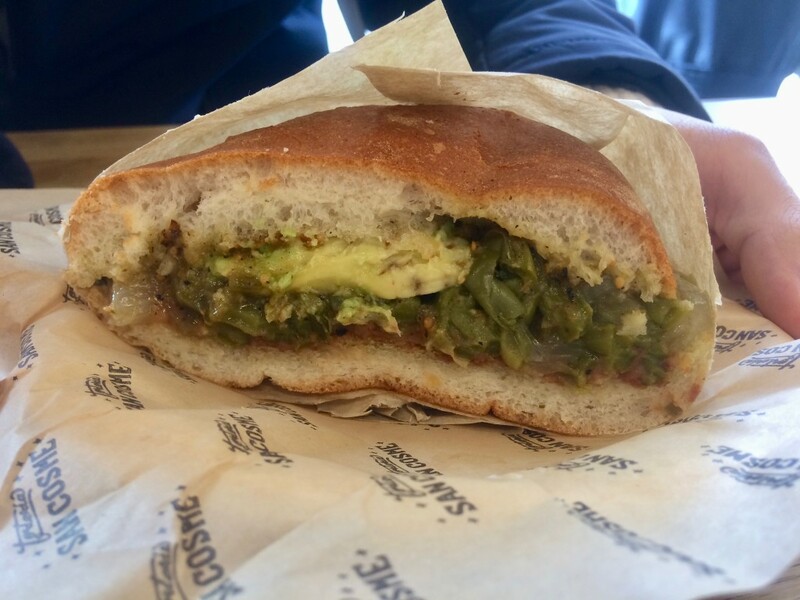 “People want to eat what they see in the park,” he explained. All the trimmings get used in a variety of ways, including in confits and mashed potatoes. 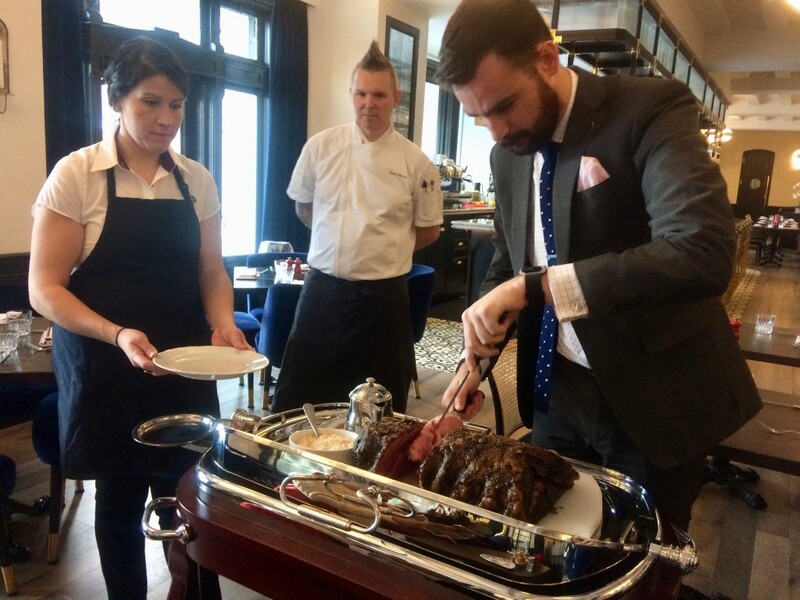 We capped the morning with a lunch in the recently renovated Vermillion Room, where chef Ryan Watson oversaw the carving of a melt-in-your-mouth Alberta raised prime rib roast, matched with mashed potatoes, and a platter of roasted vegetables. A newly introduced Sunday night special! The Fairmont Banff Springs is truly a world of its own. 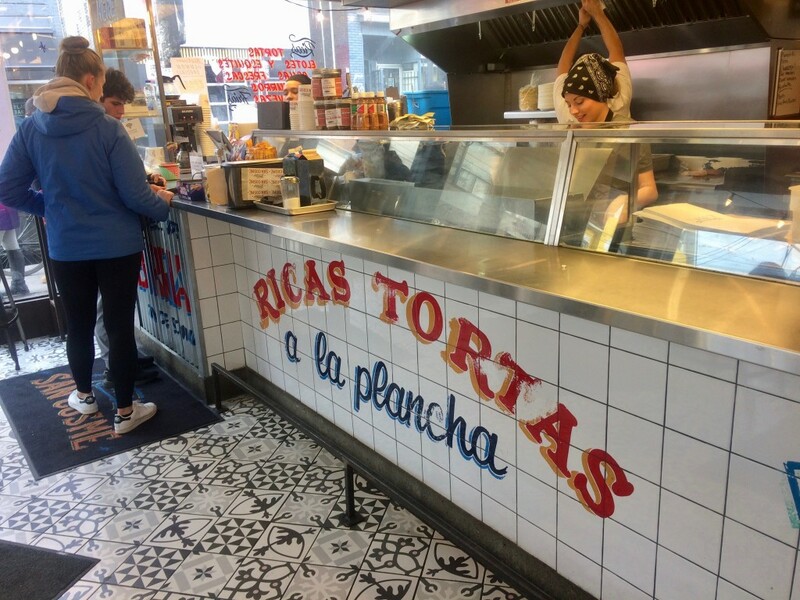 It’s a place where you’ll never get bored…or hungry. 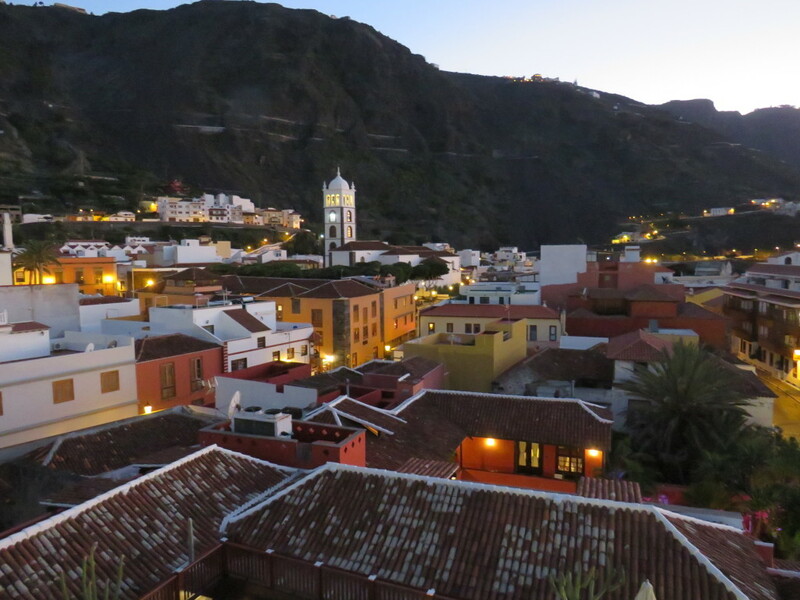 AUTHENTIC TENERIFE: Go north for the real Canary Island lifestyle. 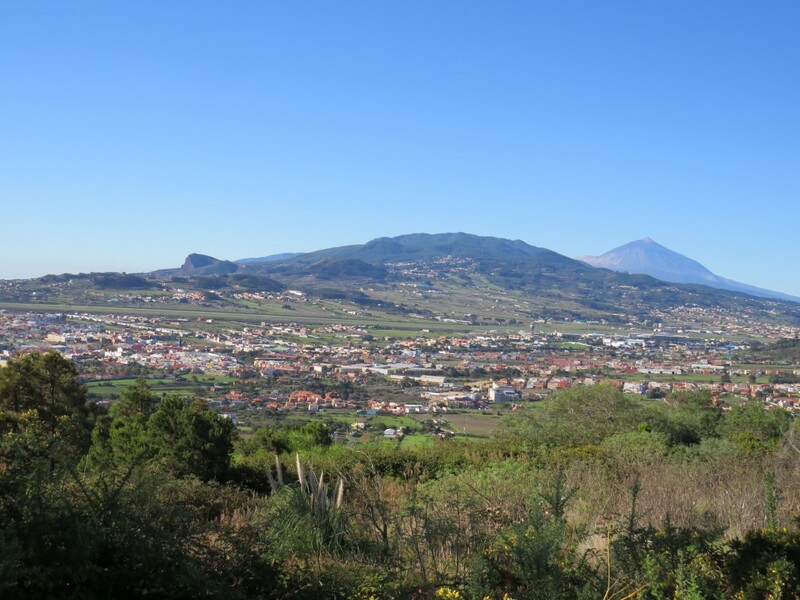 Posted on November 28, 2018 | Comments Off on AUTHENTIC TENERIFE: Go north for the real Canary Island lifestyle. 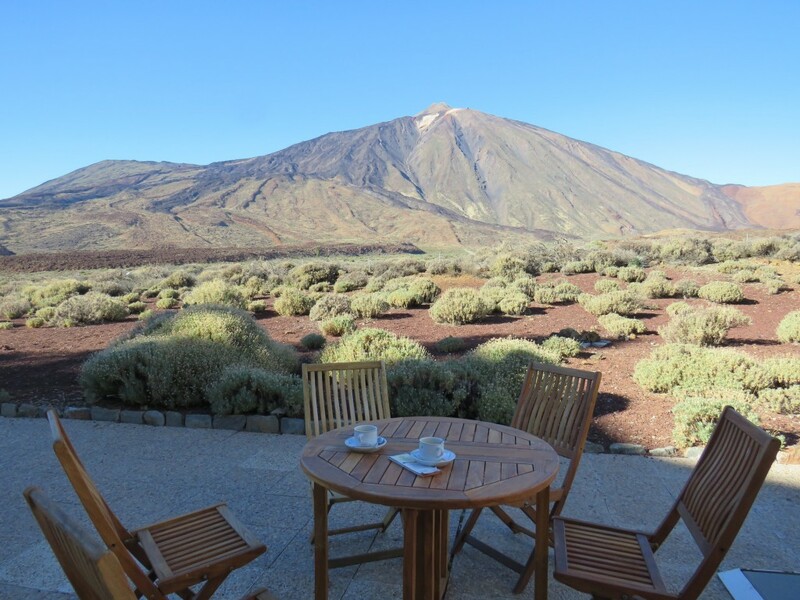 Tenerife is a volcanic island (321 volcanos, but only one active) with a year round average temperature of 23ºC. It has an area of 1056 sq. km, is 250 km in circumference and has a population of 900,000 that swells to almost six million with the tourist influx every winter. In the mid ‘70s the government wanted to jump-start the economy and started offering package tours from the UK to the south of the island, known for its beaches and hotter weather. The Brits bought in big time, and still do. 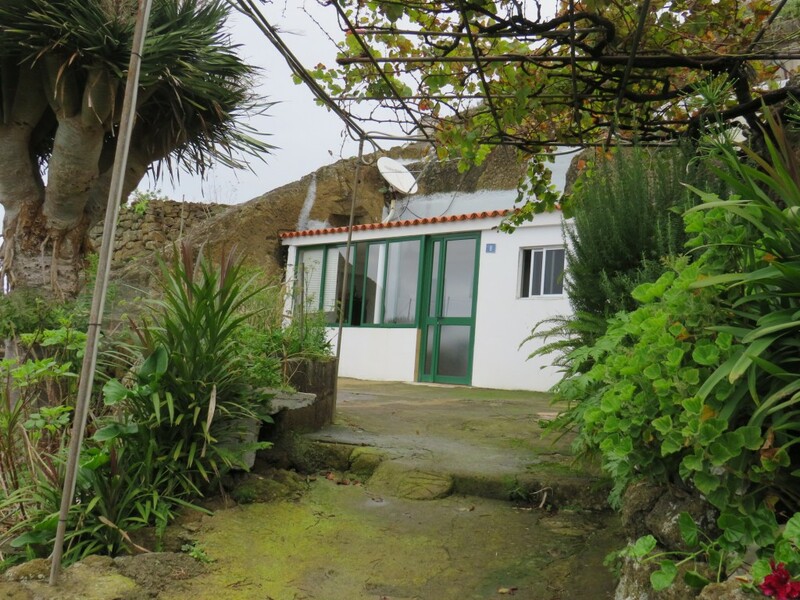 However, there is a move afoot to draw tourists to the more “authentic” northern end of the island where the majority of the Canarian population lives. 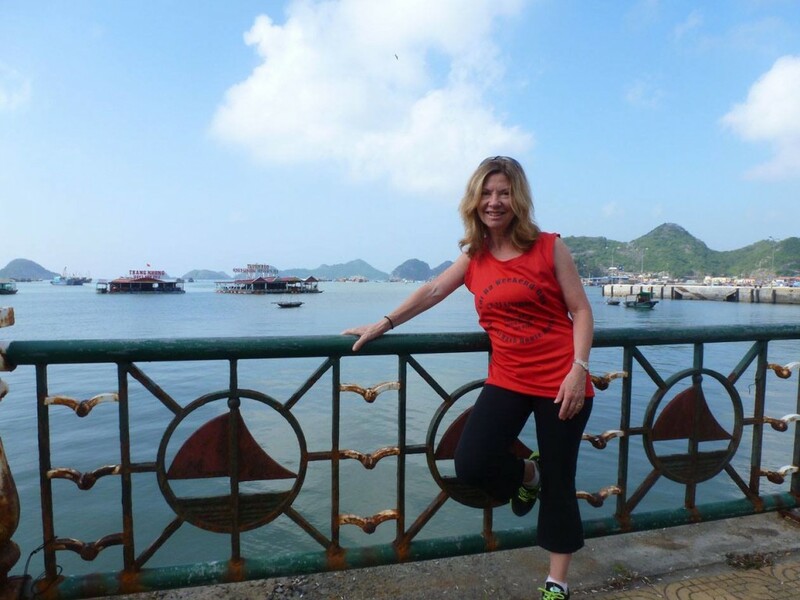 I wanted to explore the authentic side of the island so I stuck to the north where the rocky landscape was layered with terraced farms, wineries, and hiking and biking trails. 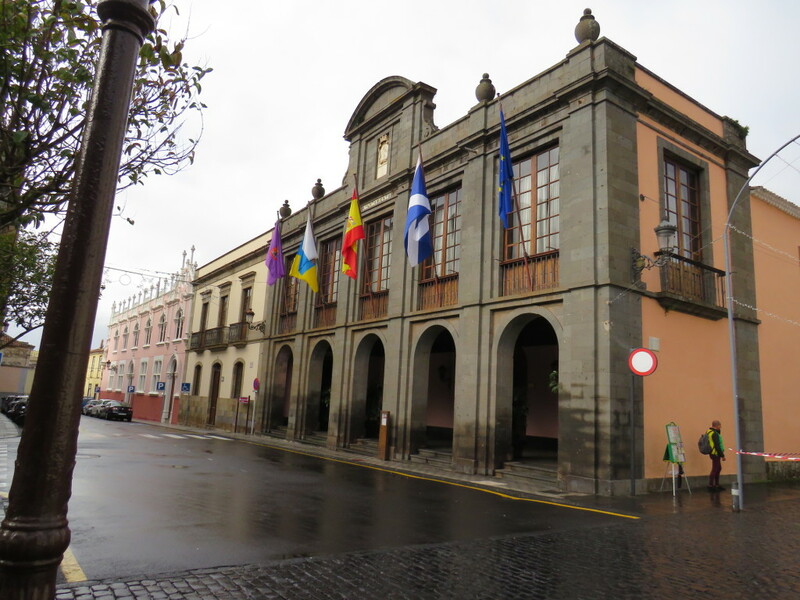 Home base was the La Laguna Gran Hotel, in La Laguna, a town of 125,000 that was named capital of the island when the Spanish came in 1496. (In 1823 Santa Cruz became the capital because it was a port town.) At 550 meters above sea level, the town was seven km from the coast, and dotted with majestic buildings that once belonged to nobility but now are mostly government offices. Cathy told me to look for crowns embedded the crests above front entrances. “That signifies royalty,” she explained. Unusual for a volcanic island, this town was flat. 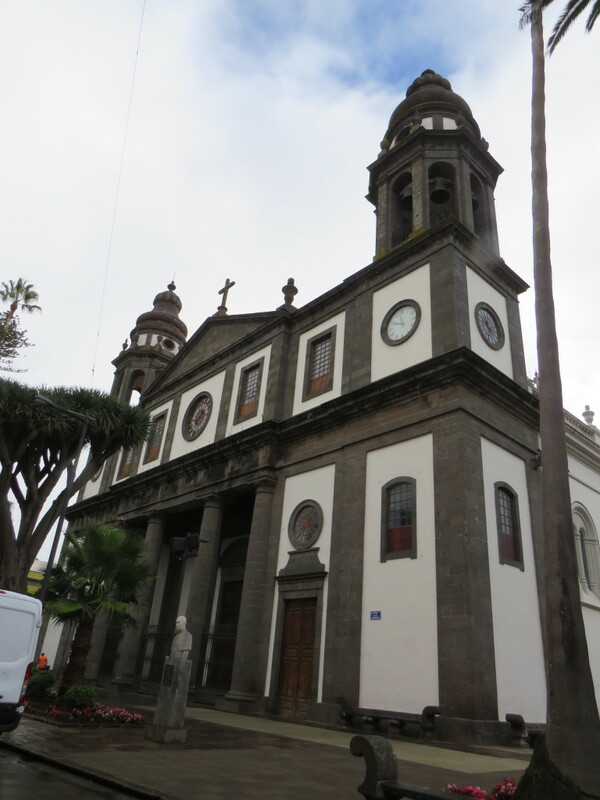 It was named a World Heritage UNESCO site in 1999, boasted a university, cathedral and 16th-18th century houses with balconies made of tough, weather-resistant Canarian pine. I was fascinated with the town’s convent of Santa Catalina de Siena where 19 nuns lived. A city block in size with a vegetable garden and courtyard, it had screened wooden balconies on one corner so the nuns could see the rest of the world (they never go out). Home to the mummified body of Maria de Jesus de Leon y Delgado, a nun from the 17th century, the convent is open one day a year (Feb. 15) so the public can pay their respects to her. Lunch was in Taganana, known as the village at the end of the world. Why? It’s near the end of the coastal road in Anaga. 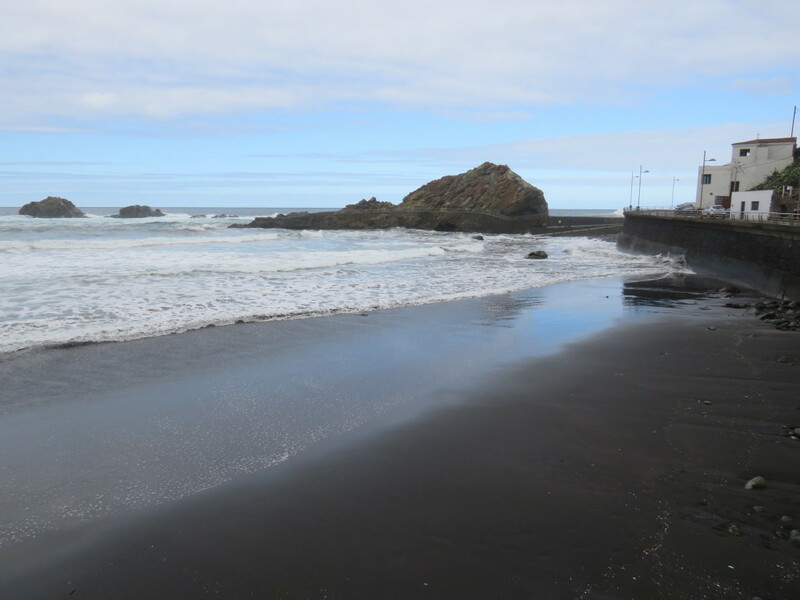 Note the colour of the beach…black sand.At the beach front restaurant Casa Africa. we dug into fresh fish, potatoes and salad. Next was San Andres and Las Teresitas Beach. “The sand at this beach used to be black from the volcanic rock, but the government had gold sand brought in from the Sahara (when it was the property of Spain) because the black sand grew too hot in the sun and burned your feet,” Cathy said. Santa Cruz, Tenerife’s capital, was founded in 1825 and with its population of 250,000 it is the largest city in the North. 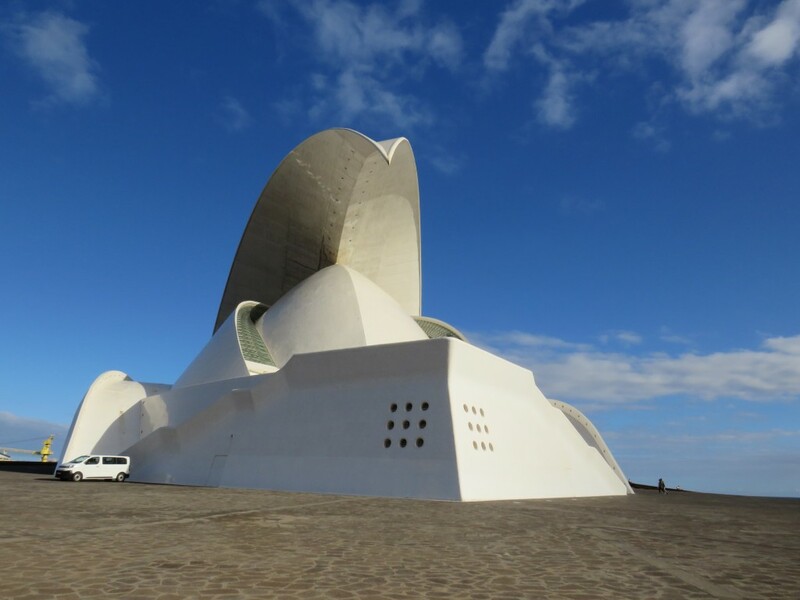 Perhaps its most famous structure is the Auditorio de Tenerife, designed by architect Santiago Calatrava and completed in 2003. He also designed salt water swimming pools by the ocean. “The residents were not too happy at first since it cost millions. They would have preferred the money to be spent on schools,” explained Cathy. And yet, it was beautiful, and many people were enjoying the water view from it’s beautifully designed cafe. 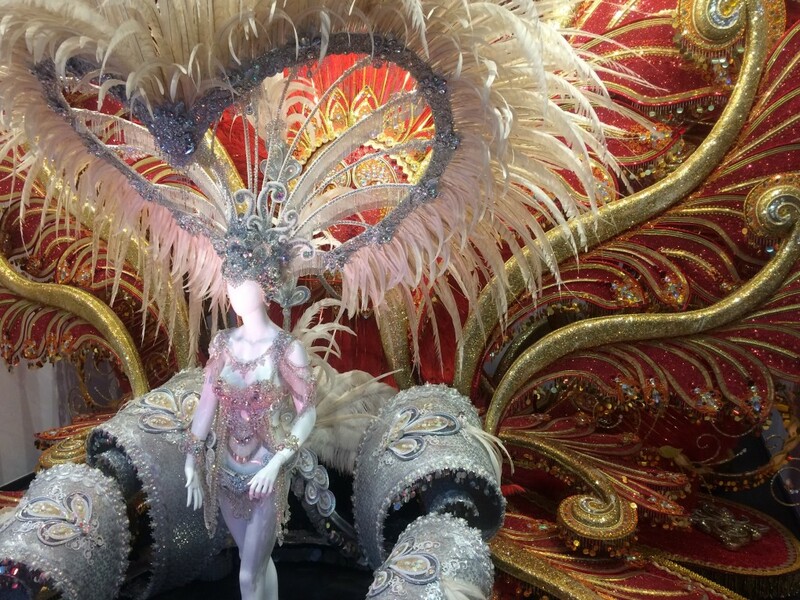 One of Santa Cruz’s newest attractions is La Casa Carnaval, the Carnival Museum. Walking into the building, the first thing I set my eyes on was the Queen’s costume from 2018. An astounding assemblage of red and gold, glitter, feathers and absolute fabulousness, I discovered it had wheels underneath. “The costume weights 360 kilos. The Queen must walk into her costume, then she is crowned with the 11 kilo headpiece,” Miriam, my museum guide explained. Every year a queen, granny and girl child (girls 5-8 years) are elected. There is even a Reina Infantil del Carnaval, who makes sarcastic political statements. Just about every Canarian is involved with a murgas, or themed group that spends all year devising their costumes. Bands are made of mock instruments fitted with kazoos and the characters that are seen every year include Michael Jackson, Johnny Depp’s Pirate of the Caribbean, Miss Piggy, Fidel Castro, Groucho Marx…and Canadian Mounties! 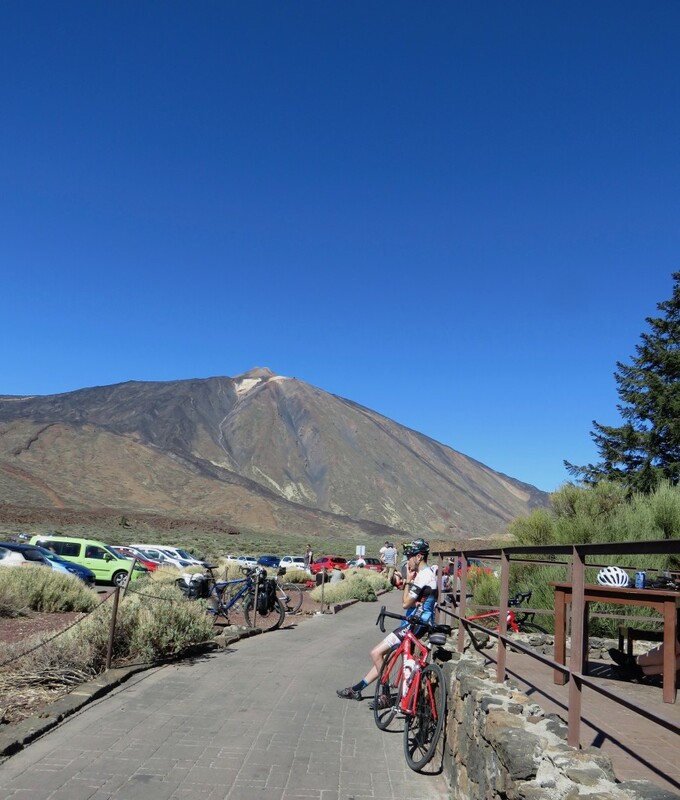 In the center of the island is Teide National Park, where you can climb Spain’s highest peak, Mt. 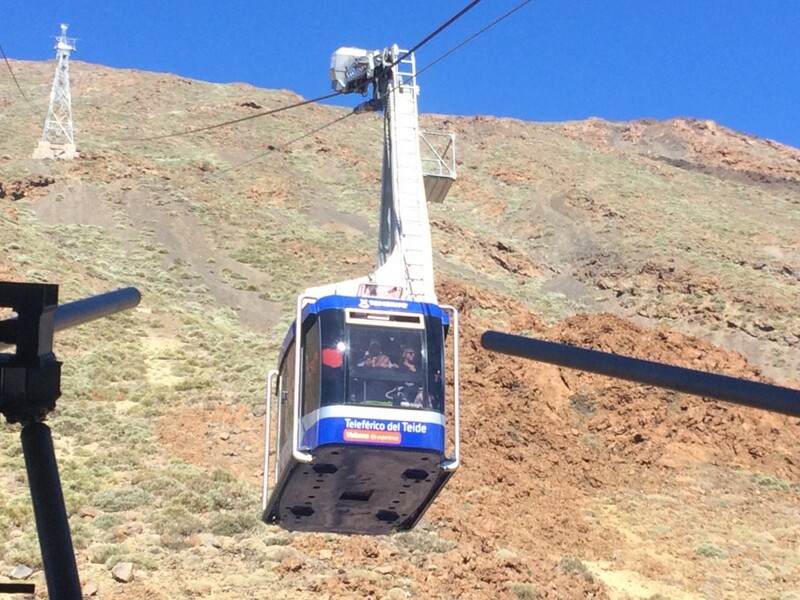 Tiede (or take the cable car, like me). Volcanic lava chunks from the 3000-meter-high mountain were scattered about everywhere, giving the area an almost surface-of-the-moon appearance. 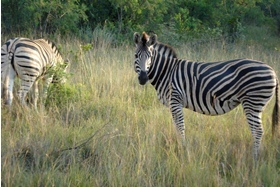 This is a popular destination and gets almost three million visitors a year. If you opt to climb the final summit, which takes around 45 minutes from the top of the cable car you have to book in advance. They only let 200 people go up a day, 50 per hour. Go from the lower car park and you don’t need a reservation, just four hours to go up and four to go down. 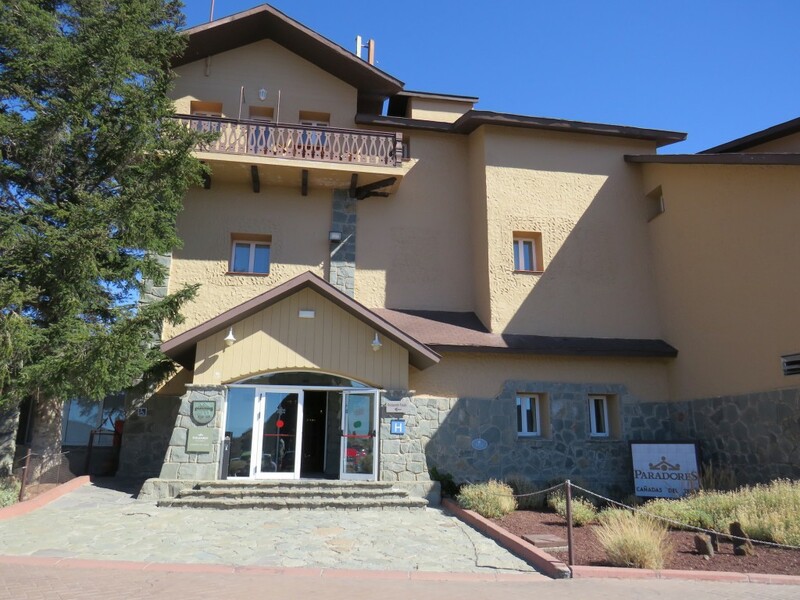 Down the road from the cable car was Parador de las Cañadas del Teide. Open year round, the hotel offers guests a stargazing program since the area’s dark skies have made it one of the top astronomy locations in the world. The 37-room property is popular with cyclists who use the area for high-altitude training. “Lance Armstrong came here for five years to train. And British cyclist Chris Froome stayed here. 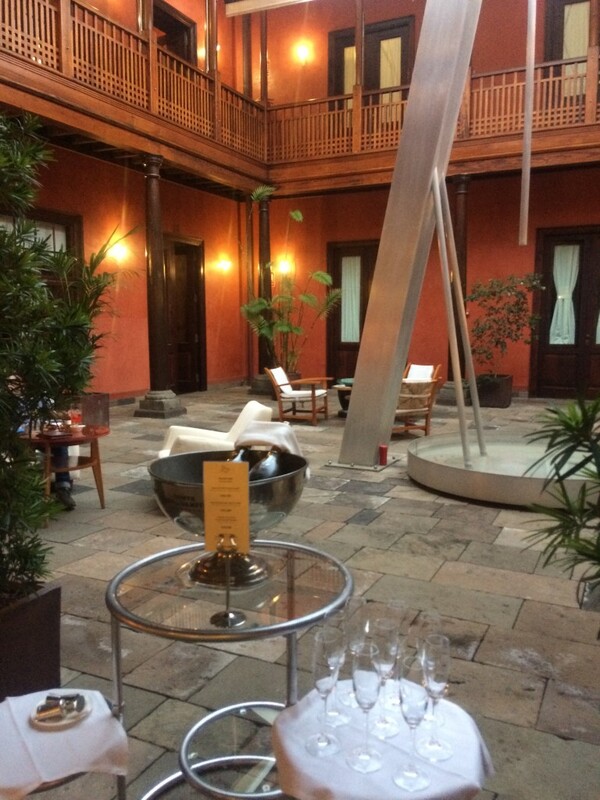 Guests like the location and food,” explained Alejandro Garcia Valerio, the hotel’s director. 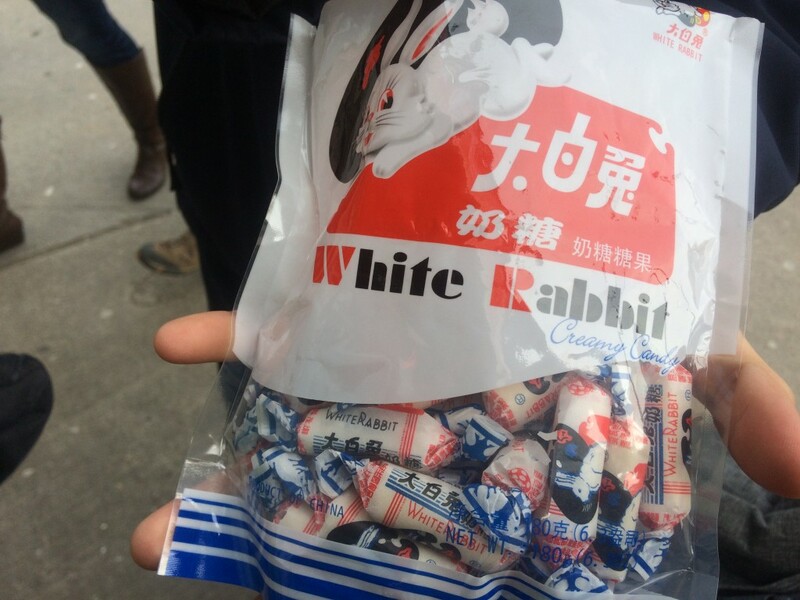 Heading to the dining room, I learned that goat and rabbit were the most popular signature dishes. 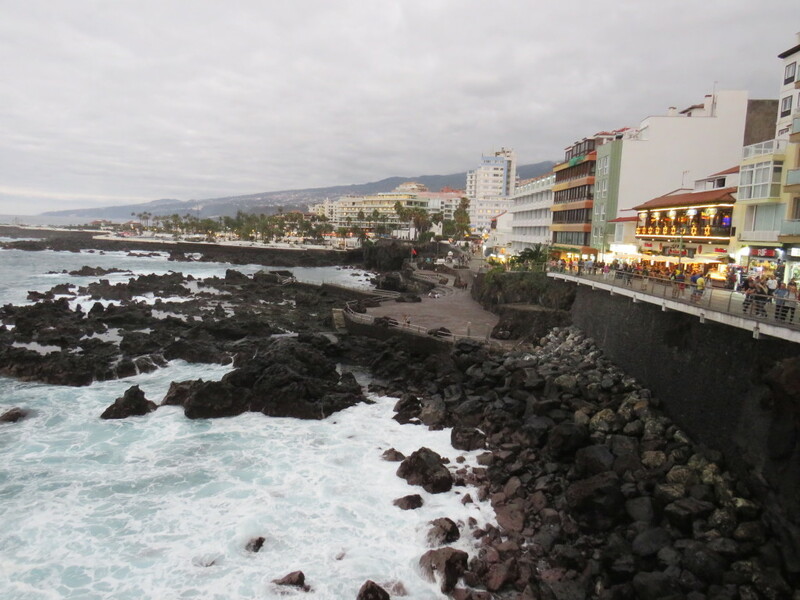 In Puerto de la Cruz, I joined the crowds and walked along the sea wall, then headed to Plaza del Charco to people watch and sip a delicious barraquito coffee (Licor 43, sweetened condensed milk, steamed milk, and espresso) at one of the square’s many cafes. 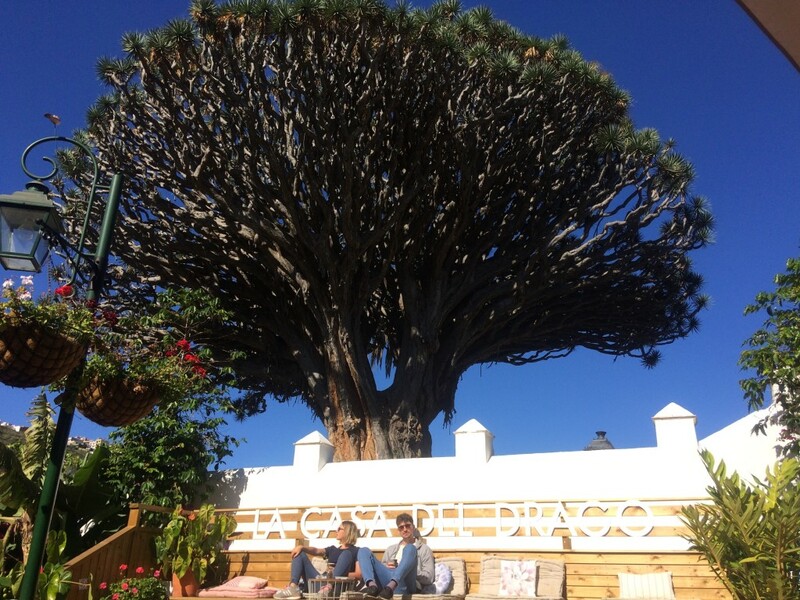 Tenerife is covered with spikey odd trees that are not really trees, but a sort of cactus-like plant called Dragon Trees. 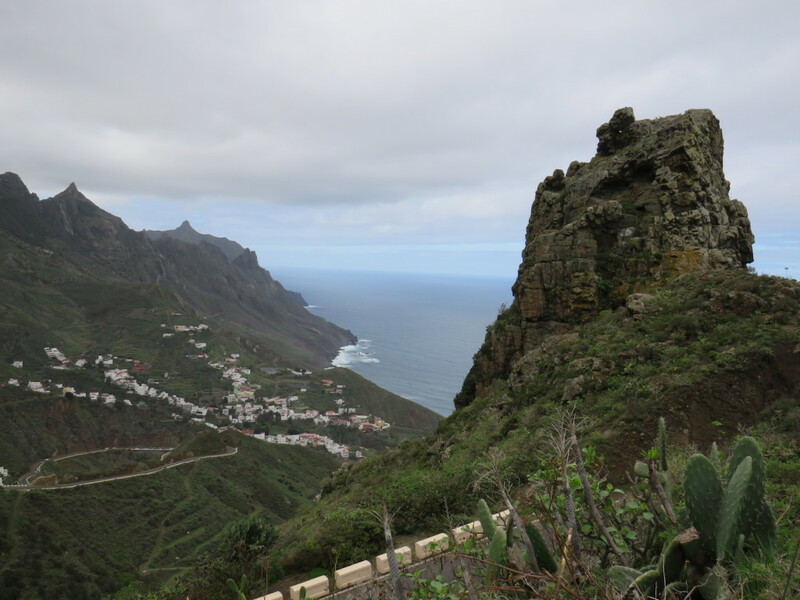 In Icod de los Vinos I saw the island’s 500-year-old specimen and tried some of the sweet Drago’s Blood liquor. 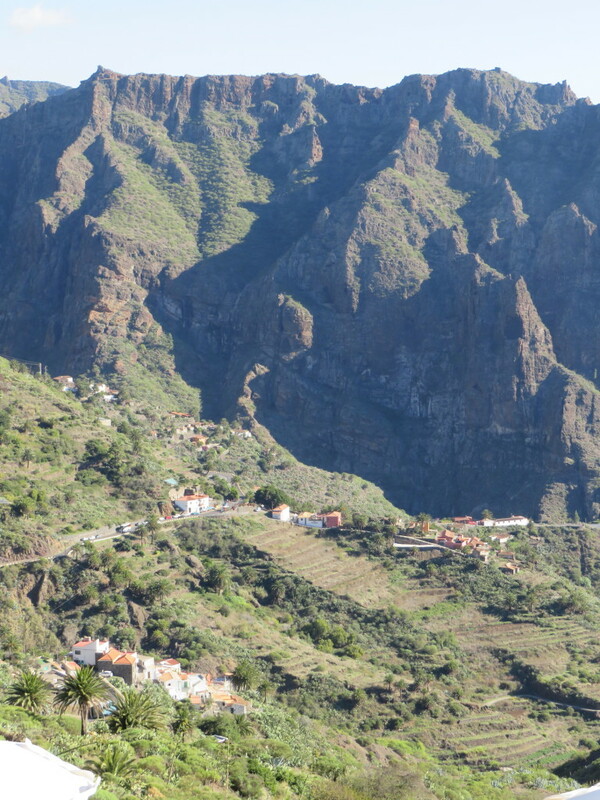 Perhaps one of the most picturesque spots I visited was the hamlet of Masca. Winding pathways took me past mountainside homes looking down on terraced gardens and the blue ocean. 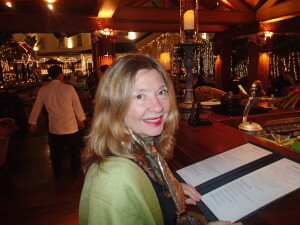 Dinner that night was in Garachico, once the island’s capital. 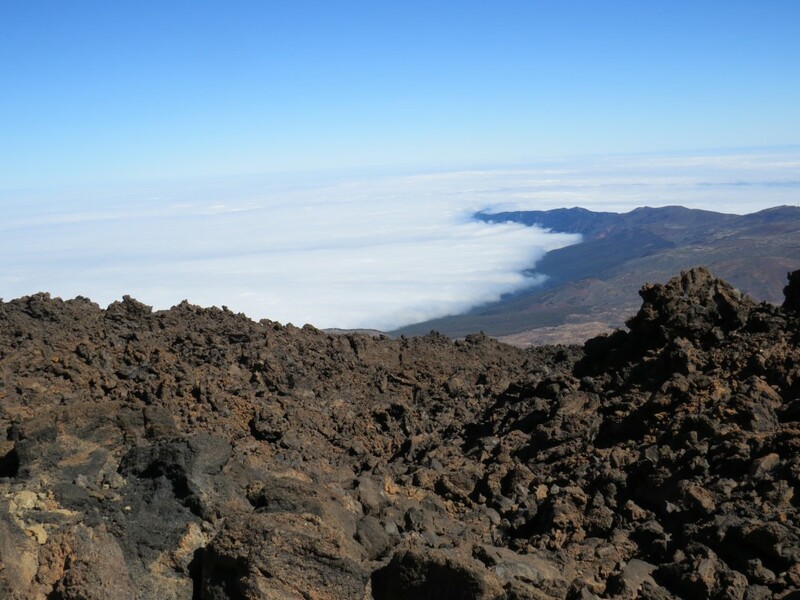 A devastating volcano eruption in 1706 changed that when the harbour was swallowed up. Rebuilt and beautiful, I was charmed by the cobbled streets, churches, and historic buildings. 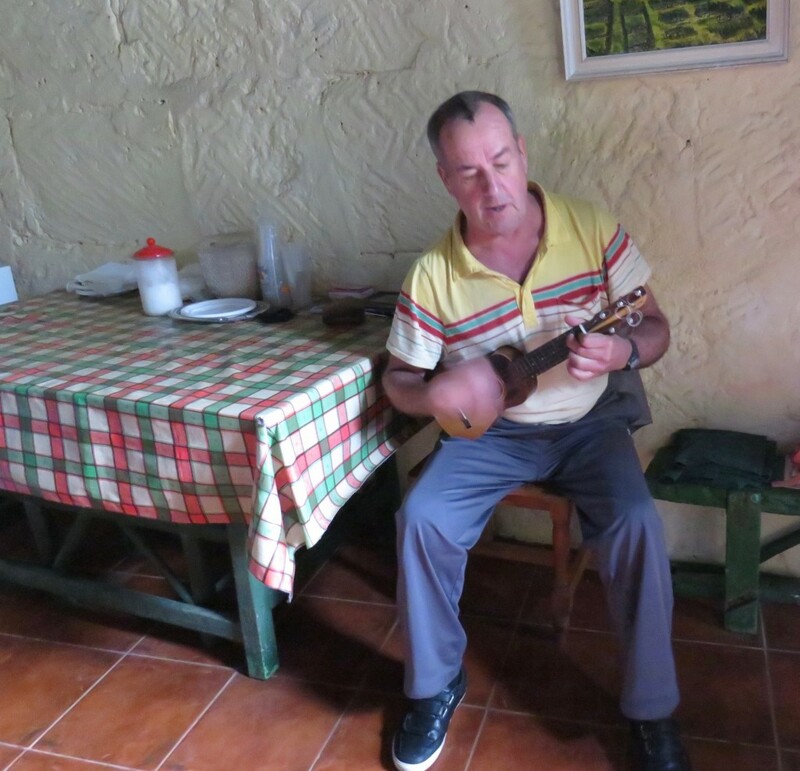 At the boutique San Los Roques hotel, owner Dominic Carayon first took me on a tour of the 17th century building. “It had been abandoned for 10 years and was in bad shape. 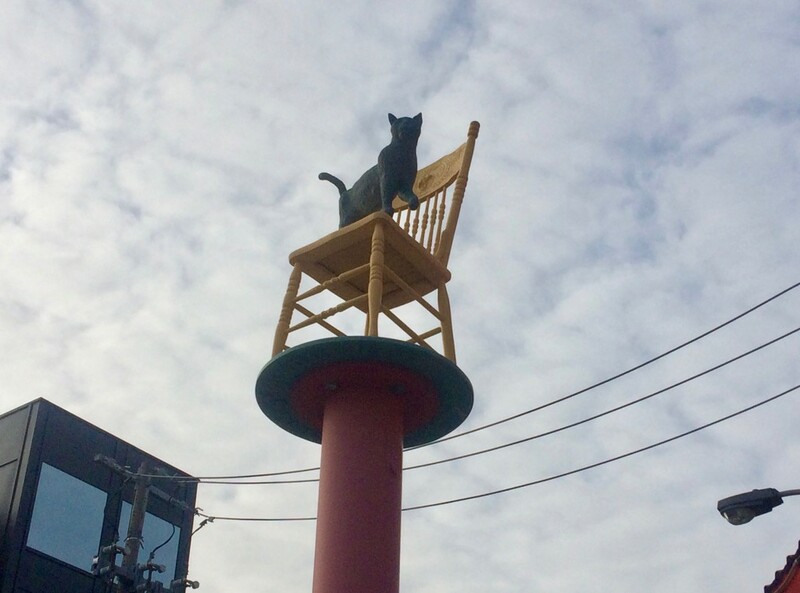 It took four years to finish the renovations. Wooden floors, warm colours and art objects could be seen throughout the elegant property and the fine food offered in the hotel’s restaurant Anturium matched the mood perfectly. We nibbled on aged goat cheese, tender wreckfish and finished the meal with a lovely light flan. “In the 1990s, Tenerife just a sun destination. This area was depressed and the population elderly. My family had an incoming travel agency working with Finland, France and Spain,” said Dominic. They knew the tourism business well and after Dominic’s father, who was French, passed away, he and his Spanish mother decided to get into the hotel business. 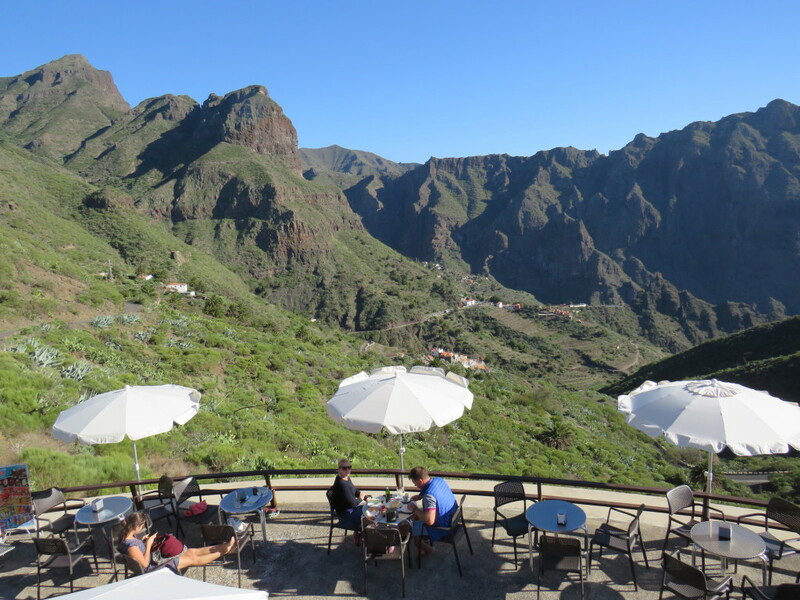 “We were the first to open in Garachico and now there are two more hotels.” Slowly, it seems, tourists are discovering this historic town. 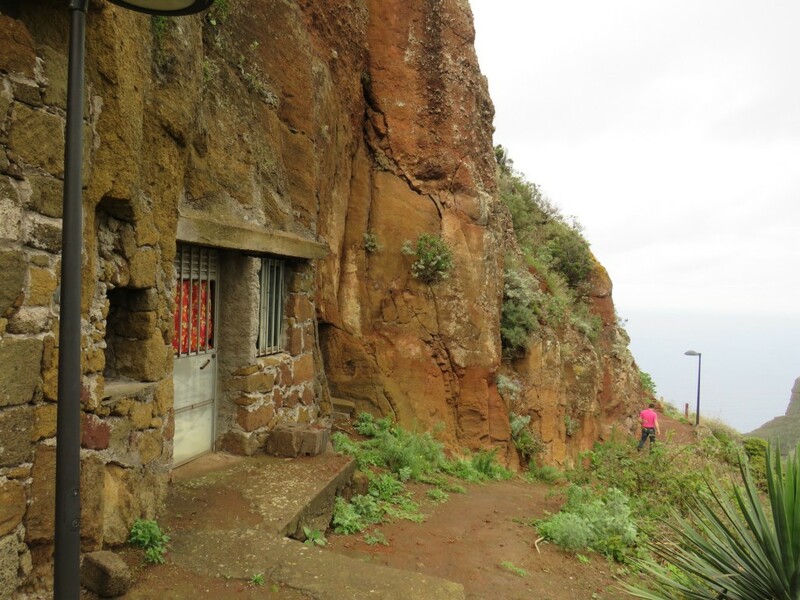 If you are looking for “authentic” Tenerife, stick to the north. 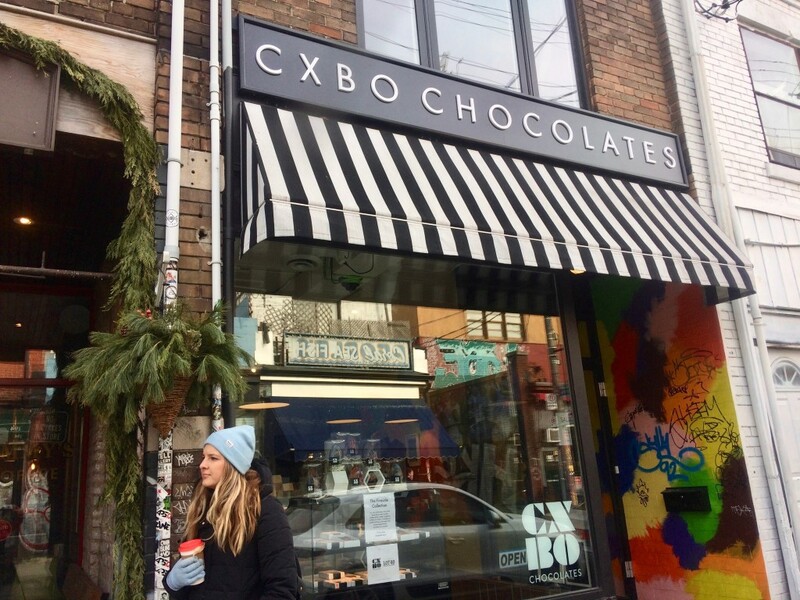 Exploring the history, natural beauty and local colour is nourshing for the soul and a far richer experience than simply lounging on the beach. 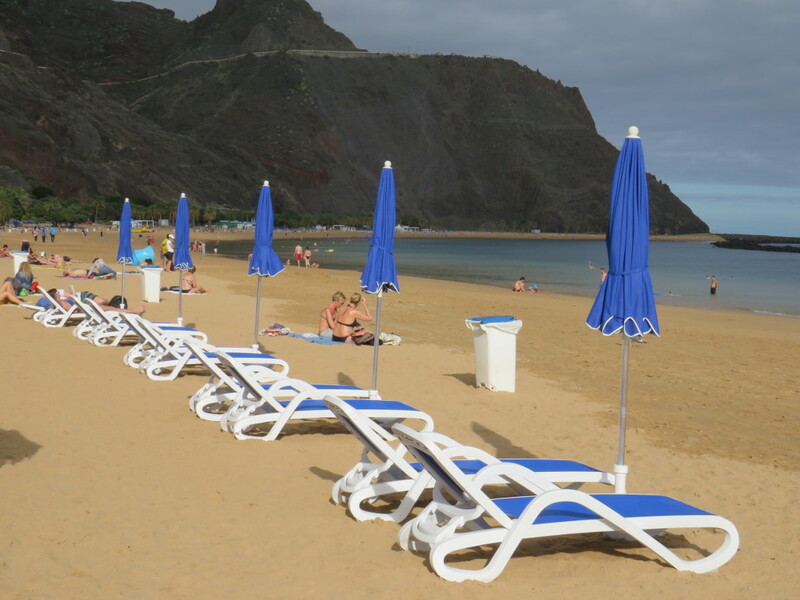 Comments Off on AUTHENTIC TENERIFE: Go north for the real Canary Island lifestyle.